Abstract: Publication date: Available online 17 April 2019Source: Aerospace Science and TechnologyAuthor(s): Yi Lin, Jian-wei Zhang, Hong Liu In order to improve the accuracy and stability of air traffic flow prediction, an end-to-end deep learning-based model is proposed in this paper. By analyzing spatial correlations of adjacent areas and temporal correlations of historical traffic on given area, we firstly apply the gridded map method (including the flight levels) to encode the whole air traffic flow situation into a new data representation, i.e., traffic flow matrix (TFM). By the proposed data representation, inherent features of air traffic flow and their transition patterns on different cells and flight levels can be represented comprehensively. Learning from the powerful ability of convolutional neural network and recurrent neural network on modeling spatial and temporal correlations, the ConvLSTM module is proposed to build a trainable model for air traffic flow prediction. Since the output of the proposed model is also the TFM and shows the overall air traffic situation of studied regions, we call the proposed model as an end-to-end one. Experimental results on real data show the superior performance over existing approaches on prediction accuracy and stability. Furthermore, the proposed model can also predict the flow distribution on different flight levels in our application, which promotes the level of air traffic management. By analyzing the distribution of prediction errors on different cells, flight levels and predicting instants, we can draw the conclusion that spatial and temporal transition patterns of flight flow in air traffic system are fully learned by the proposed model. With the proposed model, more efficient air traffic flow measures are expected to be fulfilled to improve the operation efficiency. Abstract: Publication date: Available online 16 April 2019Source: Aerospace Science and TechnologyAuthor(s): Antonio Filippone, Mengying Zhang, Nicholas Bojdo A summary is given of the validation of an integrated aircraft environmental simulation software, with focus on acoustic and engine exhaust emissions. First, an experimental campaign was carried out to gather noise data of several commercial aircraft on departure from Manchester airport (ICAO code: EGCC). Field measurements were taken with microphones placed at a point 8,500 m (4.6 n-miles) from the estimated brake-release point. The departure measuring point was chosen due to the variability in flight trajectories. Comparisons between measurements and numerical predictions are shown for 12 commercial airplanes: A319-111, A320-214, A321-211, A330-243, A330-343, A350-900, A380-861, B737-800, B757-200, B787-800 and -900 versions, and finally the ERJ-195. The validated airplane models are used with a multi-objective, multi-parameter trajectory optimisation at the same airport to determine optimal departure profiles for airplanes in three weight classes: commuter jet, medium range transport, and long-range transport. It is demonstrated how different or concurrent cost functions (noise, fuel consumption, environmental price) lead to considerably different flight profiles and environmental emissions. Abstract: Publication date: Available online 16 April 2019Source: Aerospace Science and TechnologyAuthor(s): Tinglong Huang, Lianjie Yue, Xinyu Chang A supersonic slot jet issuing from a bleed system and impinging into a plenum is numerically investigated to deepen our understanding of the flow field and heat transfer of a fully confined impinging jet. The air of the slot jet is forced to exhaust from a plenum in unidirection, resulting in a fully confined configuration. It is of significant practical interest because of its presence in the bleed systems of a scramjet or other related applications. Three primary factors are surveyed, i.e., impingement angle, impingement distance, and back pressure at the plenum exit. The results show that the supersonic slot jet spontaneously generates a plate shock standing on the impingement wall and a strong jet shock on the right side of the jet core. On the left side, the jet shear layer can directly impinge the wall because of the pressure self-adaption effect of a recirculation region. The jet shock and jet shear layer result in two peaks of Stanton number. As the impingement angle increases, the jet shock weakens gradually and moves toward the impingement region of the shear layer until the shock disappears. And thus a single heat peak occurs in place of the previous two peaks. When the downstream flow of the plenum is choked, a wall jet pattern is exhibited because of the formation of a large scale recirculation region. The walls suffer severe aerodynamic heating as the plenum back pressure increases. In particular, the impingement wall endures the maximum thermal load at a certain back pressure at which the jet reduces to the sound speed. The plenum should be controlled to keep the back pressure below this threshold so that the slot walls Stanton number won't increase further. And the plenum should be designed as high as possible to relieve its thermal load. Abstract: Publication date: Available online 16 April 2019Source: Aerospace Science and TechnologyAuthor(s): Wei Li, Qiuqiu Wen, Yu Yang This paper focuses on the dynamic stability of spinning missiles equipped with two-loop autopilot considering the seeker disturbance rejection rate parasitical loop (DRRPL) effect induced by attitude disturbance of projectile. The representative mathematical model of spinning missiles in the non-spinning coordinate system is established, and the cross-coupling effect between the pitch and yaw induced by the rotation motion of missile body is analyzed and decoupled. The two-loop acceleration autopilot for each channel is designed with the conventional design method, and the relationship between the autopilot gains and the expected design indexes is deduced. A proportional navigation guidance (PNG) system model with consideration for the seeker DRRPL is further proposed in the form of complex summation. After strict mathematic deduction, the sufficient and necessary condition of the dynamic stability for spinning missiles is obtained. Numerical simulations and discussions under different cases are conducted to demonstrate the validity of stability condition. The results indicate that the stability of a spinning missile is closely related to the amplitude of the seeker DRR, the rolling rate, and the autopilot design indices. The stable region of the autopilot design frequency is obtained by solving the dynamic stability condition. To meet the requirement of stable controlling at a constant spinning rate, it was found to be effective to decrease the amplitude of the seeker DRR for spinning missiles, employ the lead angle decoupling approach to the commands for the servo system, and guarantee that the autopilot design frequency is lower than the critical value. The dynamic stability condition derived in this paper is useful for evaluating the stability of a spinning missile with consideration for the seeker DRRPL, and the conclusions obtained can provide guidance for the autopilot design of spinning missiles. Abstract: Publication date: Available online 16 April 2019Source: Aerospace Science and TechnologyAuthor(s): G.D. Di Martino, S. Mungiguerra, C. Carmicino, R. Savino Computational fluid dynamics is becoming a key tool for reducing the hybrid rocket operation uncertainties and development cost, but numerous challenges, due to the complexity of modeling the solid fuel consumption mechanism and the interaction with the reacting flowfield, have still to be addressed. These latter features are further complicated with paraffins for the melted-fuel entrainment phenomenon. This paper presents a computational thermo-fluid-dynamic model of the internal ballistics of hybrid rockets burning gaseous oxygen and paraffin-based fuel. With the purpose of predicting the local fuel regression rate, the model is coupled with an improved gas/fuel-surface interface treatment based on local mass, energy and mean mixture fraction balances, combined to an additional analytical equation for the calculation of the entrainment fraction of the fuel consumption rate. Parametric analyses are carried out to assess the effect of fuel properties on the regression rate. Several experimental test cases, obtained from static firing of a laboratory-scale rocket, are simulated. Calculated regression rates show an error with respect to the measured data around 10% in the worst case. Chamber pressure is predicted with lower accuracy, with errors less than 20%; the main factor of deviation is shown to be the estimation of the combustion efficiency. Abstract: Publication date: Available online 15 April 2019Source: Aerospace Science and TechnologyAuthor(s): Chuan Ma, Honghua Dai, Caisheng Wei, Jianping Yuan The estimation of the inertia characteristics of a tumbling target before capturing is one of the greatest challenges in on-orbit servicing missions, especially when the time interval between consecutive measurements is large or the rotational speed of the target is very high. In this paper, a two-stage constant state filter (TCSF) is proposed to predict the attitude and estimate the inertia characteristics, including the principal inertia ratios and the principal inertia axes' directions, of a high-speed tumbling target. The man innovation of this paper is to design an Affiliate Filter to estimate the inertia tensor of the target, based on the estimates of angular velocity from an Adaptive Constant State Filter. Compared with the conventional estimation methods like the unscented Kalman filter method, the proposed TCSF shows better stability and accuracy in strongly nonlinear situations, such as that where the time interval between consecutive measurements is 10 s and the angular velocity is more than 14 deg/s. The Monte Carlo simulations have been proposed to demonstrate the performances of the proposed TCSF method. Abstract: Publication date: Available online 15 April 2019Source: Aerospace Science and TechnologyAuthor(s): Daniel González-Arribas, Manuel Soler, Manuel Sanjurjo-Rivo, Maryam Kamgarpour, Juan Simarro Convective weather, and thunderstorm development in particular, represents a major source of disruption, delays and safety hazards in the Air Traffic Management system. Thunderstorms are challenging to forecast and evolve on relatively rapid timescales; therefore, aircraft trajectory planning tools need to consider the uncertainty in the forecasted evolution of these convective phenomena. In this work, we use data from a satellite-based product, Rapidly Developing Thunderstorms, to estimate a model of the uncertain evolution of thunderstorms. We then introduce a methodology based on numerical optimal control to generate avoidance trajectories under uncertain convective weather evolution. We design a randomized procedure to initialize the optimal control problem, explore the different resulting local optima, and identify the best trajectory. Finally, we demonstrate the proposed methodology on a realistic test scenario, employing actual forecast data and an aircraft performance model. Abstract: Publication date: Available online 13 April 2019Source: Aerospace Science and TechnologyAuthor(s): Jianying Wang, Haizhao Liang, Zheng Qi, Dong Ye This paper presents a novel trajectory planning algorithm for hypersonic glide vehicles based on differentially flatness theory and mapped Chebyshev pseudospectral method (MCPM). Firstly, the flatness property of a hypersonic glide vehicle dynamics system is extended explicitly by introducing a pseudo control input along the opposite direction of aerodynamics drag. In this way, all the states and controls of the system can be represented by flat outputs and their derivatives, and the trajectory planning problem is formulated into the flat output space with differential constraints entirely eliminated. Secondly, the optimization problem in the flat output space is converted into a nonlinear programming one via the mapped Chebyshev pseudospectral method. The MCPM employs the conformal mapping principle to discretize the flat outputs at the time interval, in terms of which, the closely clustered Chebyshev points near the boundary are stretched and the ill-conditions of the differential matrix is improved. The Barycentric Lagrange interpolation algorithm is then utilized to interpolate the flat output functions, which is seized of better approximation properties than polynomial interpolation. Finally, the transformed nonlinear programming problem are solved by sequence quadratic program technique. The states and controls are then generated by the expressions of the flatness outputs. At the end of this paper, numerical simulations are performed to evaluate the proposed approaches, and comparisons are made with traditional methods. Simulation results demonstrate that the proposed differentially flatness based mapped Chebyshev pseudospectral method possessed better computing efficiency than traditional ones without losing the merits of high precision. Abstract: Publication date: Available online 12 April 2019Source: Aerospace Science and TechnologyAuthor(s): Qingyu Qu, Ming Xu, Tong Luo The lifetime of the existing attitude and orbit control systems (AOCS) generally depends on the amount of the fuel carried on a spacecraft. This paper proposes a novel design concept for a low Earth orbit (LEO) spacecraft named In-Drag Sail with Individually Controllable Elements (IDSICE), which can release the fuel's limitation to its attitude control system. IDSICE is designed to have four different working modes, which are Compression and Storage mode (CS mode), Orbital Flight mode (OF mode), Attitude Control mode (AC mode), and De-Orbiting mode (DO mode). By switching between different modes, it can achieve different missions. When IDSICE is in AC mode, the aerodynamic torques can be applied to completed the attitude control phase. When IDSICE is in DO mode, its area-to-mass ratio is enlarged so that the orbit altitude can decrease rapidly to achieve the de-orbiting phase at the end of the life. The decentralized layout is applied in IDSICE and most components have redundant backups, which allows a higher fault tolerance compared with the conventional layout. Finally, some necessary simulations are made, which verified the feasibility of the attitude control and de-orbiting methods proposed based on IDSICE. Abstract: Publication date: Available online 12 April 2019Source: Aerospace Science and TechnologyAuthor(s): Hongda Zhao, Jifeng Ding, Weihong Zhu, Yi Sun, Yizhi Liu In order to solve the failure of traditional methods in the response prediction for the complex spacecraft under the wide frequency shock load, this paper provides the FE-SEA (Finite Element-Statistical Energy Analysis) hybrid modeling technique to improve the virtual mode synthesis and simulation (VMSS). Taking the L-shape typical structure as an example, the research is developed through the numerical analysis and experiment verification. In the FE-SEA hybrid model of the typical structure, the two honeycomb boards which have a higher modal density are built as the SEA model, while the connection beam that has a larger stiffness is established as FE model. And then the hybrid model is computed with the VMSS code, giving the transient response results. A shock experiment for the typical structure is carried out to verify the correctness of the methodology above. The results indicates that the numerical results have the similar trend and magnitudes with the ones of the experiment in time domain, and the shock response spectrum (SRS) of the numerical results can realize the ±6 dB tolerance limit compared with the experiment results. This paper finds that the FE-SEA hybrid modeling techniques for the typical structure can effectively overcome the problem of the dynamic differences between the substructures under the excitation of shock load, and the combination of FE-SEA and VMSS has the ability to predict the shock responses of the typical structure accurately. The research methods and conclusions achieved in this paper are expected to further extend to the shock response calculation of the complex spacecraft structures. Abstract: Publication date: Available online 12 April 2019Source: Aerospace Science and TechnologyAuthor(s): Emanuele L. de Angelis A filtering technique based on a set of recursive equations is analyzed and applied to swing angle estimation for multicopter slung load applications. Starting from the equations of motion of the coupled slung load system, an observation model is derived to autonomously measure the swing angle by means of the data available from the onboard IMU, without the need to rely on extra sensors. Provided the multicopter is subject to known control inputs, data-fusion is performed through a Fading Gaussian Deterministic approach, whose theoretical background was recently investigated by the author. In particular, the algorithm is based on a two-step set of equations derived from the minimization of a cost function where earlier data are progressively de-weighted by a fading factor, making the estimation less prone to problem unknowns. The validity of the approach is investigated by means of numerical simulations, where a tuning criterion is shown to provide the fading factor that best dampens the modeling errors with respect to the measurement noise. Estimated swing angles are then used in a sample feedback control application with the aim to simultaneously perform trajectory tracking and payload swing damping. Abstract: Publication date: Available online 12 April 2019Source: Aerospace Science and TechnologyAuthor(s): J. Zhou, J. Liu, X. Zhang, Y. Yan, L. Jiang, I. Mohagheghian, J.P. Dear, M.N. Charalambides Bird strike on aircraft remains a serious threat to flight safety. Experimental investigations employing real birds are associated with high cost and low reproducibility. Therefore, physical substitute materials are often used instead of real birds. This study investigates the soft impact loading on aluminium and laminated glass targets from ballistic gelatine and rubber projectiles. The two targets simulate strike on the aircrafts' fuselage and windshield respectively. The full field out of plane displacements of the targets were recorded for velocities 110 to 170 m s−1 using digital image correlation during gas gun experiments. A simulation model based on Smoothed Particle Hydrodynamics was developed and validated against the experimental data from all four projectile-target material combinations. It was shown that for the same momentum, a rubber projectile exerts a higher pressure on a target as compared to gelatine, even though the out of plane displacements and in-plane strains are similar. This led to fractures in the impacted laminated glass when rubber was used. The study offers new experimental data as well as efficient design modelling tools to mitigate damage imposed during bird strike. The models provide a way towards enabling the optimisation of real, large scale aircraft structures and components. Abstract: Publication date: Available online 12 April 2019Source: Aerospace Science and TechnologyAuthor(s): Gwang-gyo Seo, Yoonsoo Kim, Subrahmanyam Saderla Online system identification became an integral part of the design process for aerodynamic parameter estimation with the technological progress. This paper presents two Kalman-filter based online system identification (SID) techniques for estimating aerodynamic parameters of fixed-wing aircraft in upset condition like stall. Unlike existing SID ones, the proposed methods first include aerodynamic characteristics directly in the aircraft dynamics, i.e. variation of aerodynamic derivatives or flow separation point, associated with the upset condition. Then, the conventional or unscented Kalman filter is applied in real time to obtain optimal estimates of the aerodynamic parameters under consideration. The proposed methods are tested with real flight data sets of several aircraft to demonstrate their effectiveness and superiority to a recently proposed method. Abstract: Publication date: Available online 11 April 2019Source: Aerospace Science and TechnologyAuthor(s): Jing Chang, Zongyi Guo, Jerome Cieslak, Weisheng Chen This paper deals with the development of Integrated Guidance and Control (IGC) law for a class of hypersonic interceptors which are equipped with the infrared seeker. Since in practice the line-of-sight (LOS) angular rates are difficult to measure for this class of hypersonic interceptor, an unknown state observer based on high order sliding mode technique is firstly proposed to estimate the unknown state and disturbance precisely with the partial measurable state. Then, an adaptive Incremental Backstepping (IBS) scheme that relies on estimates of the LOS angular rates, angular acceleration measurements of the current control deflections is proposed to achieve robust tracking of a maneuvering target. The stability analysis of the closed-loop system is also conducted. At last, a series of simulation results are presented to show the great potential of the proposed IGC method in interception accuracy, even if the LOS angle rates are unmeasurable. It is shown that the proposed scheme is not only more robust to uncertainties in the hypersonic interceptor dynamics compared to conventional IGC, but also has better trajectory characteristic with less control effort. The hit-to-kill interception is achieved in the simulation results. Abstract: Publication date: Available online 11 April 2019Source: Aerospace Science and TechnologyAuthor(s): Shuo Wang, Lin Zhao, Jianhua Cheng, Junfeng Zhou, Yipeng Wang This paper investigates the task scheduling and attitude planning of single agile earth observation satellite for intensive tasks. We aim to obtain the execution strategy and corresponding attitude path at the same time by the maximization of the total number of imaged tasks together with minimization of the energy cost, where the rectangle strip observation tasks are considered. Denoting the ground task as a time-varying attitude path, the whole collaborative task scheduling and attitude planning problem is modeled in the attitude apace. To prepare for the final solution, we first design a time-dependent mechanism to determinate the start working time, based on which an energy-dependent mechanism is designed to determine the attitude path corresponding for each possible execution strategy. Using the results produced by the mechanisms to construct the evaluation process, we propose a novel pseudospectral cooperative genetic algorithm (PCGA) to obtain the effective execution strategy and attitude path simultaneously. In PCGA, the genetic algorithm is employed to search the optimal solution, while the pseudospectral procedure and cooperative concept are combined into the genetic algorithm framework to further eliminate the uncertainty and obtain a compromise solution between two objectives, respectively. Simulation results demonstrate the effectiveness of proposed model and algorithm. Abstract: Publication date: Available online 11 April 2019Source: Aerospace Science and TechnologyAuthor(s): Bo Kong, Ting Li, Qitai Eri A turbulent jet with Reynolds number of 71000, forced by a pair of pulsed jets operating 180° out of phase, is investigated using large eddy simulation. The effect of the pulsing frequency on mixing efficiency and coherent structures is considered in detail through six cases: an unforced case and five cases with different frequencies (StD=0.05, 0.1, 0.15, 0.2 and 0.3, Strouhal number based on jet diameter). The mixing efficiency is increased when the pulsing frequency is low and conversely decreases at high frequency. In the present work, the optimal frequency is found to correspond to a Strouhal number of 0.15. The coherent structures observed in the forced case are complex and are found to be significantly different with the unforced case. These structures alternate in the forced plane with flapping motion and are symmetrical in the unforced plane. The spanwise structures form at the same frequency as the pulsed jets. After formation, they grow in azimuthal direction and become tilted when moving downstream. Vortex pairing occurs when the leading part of a structure catches up to the trailing part of its predecessor. The forcing frequency does not influence the vorticity magnitude of the coherent structures but does impact their space to develop. In lower frequency case, fewer structures that are larger size are formed. In higher frequency case, more structures are generated but they are limited in the radial direction and the size of them is smaller. Based on the results, it is clear that the optimal mixing enhancement case corresponds to an effective balance between the number and size of vortex structures. Abstract: Publication date: Available online 10 April 2019Source: Aerospace Science and TechnologyAuthor(s): M. Bouziane, A.E.M. Bertoldi, P. Milova, P. Hendrick, M. Lefebvre To investigate the effects of oxidizer injection on the performance of hybrid rocket motors (HRMs), we have designed, manufactured and tested four types of injector: showerhead (SH), hollow-cone (HC), pressure-swirl (PSW) and vortex (VOR). This study is motivated by the fact that the experimental measurements of N2O/paraffin firings are poorly presented in the open literature. Besides few publications are dedicated to the characterization of novel types of injectors in hybrid rocket propulsion application such as HC, PSW, and VOR. It is advantageous that the study was conducted in the same motor configuration, with the advantage that it allowed to compare the performance of different types of injectors.This paper analyses the influence of the oxidizer injector design on the main performance parameters, such as fuel regression rate, specific impulse and combustion efficiency. First, in order to observe injector spray qualities, a series of cold tests using liquid water and liquid nitrous oxide are carried out, providing a good understanding of the spray profiles. Then, the motor performance data is obtained by a series of firing tests using N2O as oxidizer and paraffin as fuel. Comparison of the various injectors data is made with the same average oxidizer mass flux and feeding pressure. The showerhead is used as a benchmark in this study. During this experimental analysis, the VOR injector exhibits the highest regression rate, followed by HC and SH. Because the assessment of the regression rate was not enough to explain all the effects of the injectors on the motor performance, firing tests of small-scale hybrid motor have been carried out. In terms of spray properties, the PSW exhibits significant differences compared with the other injectors; it generates the smallest Sauter Mean Diameter (SMD) in the formed spray and achieves good atomization. In spite of the fact that the PSW injector leads to the lowest regression rate, it provides good specific impulse, increases the oxidizer-to-fuel ratio (O/F), as well as a uniform and smooth consumption of the paraffin fuel grain. VOR leads to the highest specific impulse. In terms of stability, VOR, HC and SH injectors exhibit lower oscillations in the chamber pressure. Some observations are made on exhaust plume intensity developed during combustion, and in firing tests with SH a blow-out phenomenon occur often. Similarly to liquid engines, it is possible in hybrid motors to increase the global propulsive performance using alternative designs of the injection system. Abstract: Publication date: Available online 10 April 2019Source: Aerospace Science and TechnologyAuthor(s): Xingling Shao, Linwei Wang, Jie Li, Jun Liu This paper investigates the trajectory tracking and attitude stabilization problem with only position measurements for quadrotors subject to position constraints and uncertainties. By introducing the one-to-one nonlinear mapping (NM) to prevent position state violation, an output constrained trajectory tracking law is developed by transforming the original restricted translational dynamics into an equivalent unconstrained subsystem. To address the uncertainties arising from parametric deviations and external disturbances, with given model information incorporated into observer design, we develop a high-order extended state observer (ESO), capable of simultaneously online estimating the uncertainties and full-states of quadrotors. Then, an output feedback based trajectory tracking and attitude stabilization approach is synthesized by integrating NM and high-order ESO via dynamic surface control (DSC), leading to a much simpler control structure and reduced implementation costs. The salient feature is that position constraints, uncertainties as well as output feedback difficulties can be comprehensively handled with acceptable control performance. It is shown via Lyapunov stability that all signals in the closed-loop system are guaranteed to be uniformly ultimately bounded. Simulation results are provided to validate the benefits and effectiveness of the proposed method. Abstract: Publication date: Available online 9 April 2019Source: Aerospace Science and TechnologyAuthor(s): N. Bartoli, T. Lefebvre, S. Dubreuil, R. Olivanti, R. Priem, N. Bons, J.R.R.A. Martins, J. Morlier Surrogate models are often used to reduce the cost of design optimization problems that involve computationally costly models, such as computational fluid dynamics simulations. However, the number of evaluations required by surrogate models usually scales poorly with the number of design variables, and there is a need for both better constraint formulations and multimodal function handling. To address this issue, we developed a surrogate-based gradient-free optimization algorithm that can handle cases where the function evaluations are expensive, the computational budget is limited, the functions are multimodal, and the optimization problem includes nonlinear equality or inequality constraints. The proposed algorithm—super efficient global optimization coupled with mixture of experts (SEGOMOE)—can tackle complex constrained design optimization problems through the use of an enrichment strategy based on a mixture of experts coupled with adaptive surrogate models. The performance of this approach was evaluated for analytic constrained and unconstrained problems, as well as for a multimodal aerodynamic shape optimization problem with 17 design variables and an equality constraint. Our results showed that the method is efficient and that the optimum is much less dependent on the starting point than the conventional gradient-based optimization. Abstract: Publication date: Available online 9 April 2019Source: Aerospace Science and TechnologyAuthor(s): Zongxia Jiao, Bo Yu, Shuai Wu, Yaoxing Shang, Haishan Huang, Zhewen Tang, Renlei Wei, Chunfang Li The design of flight control actuation system is facing major challenge due to the development of more electrical aircraft. The task is to find the combinations of power sources, actuators and computers, which becomes more complex because of the new power sources and actuator types of more electrical aircraft. It is impossible to determine optimal architecture by traditional trial-and-error method within acceptable time. Therefore, the need for new methodology for actuation system architecture design emerges. This study proposes an intelligent design method which has steps of design space exploration of actuation system architectures by constraint satisfaction problem (CSP) method, safety assessment process to exclude unsafety solution, multi-objectives optimization to get Pareto optimal front and comprehensive decision for final architecture via analytic hierarchy process. And the design method is implemented in python and a software platform is developed. Furthermore, within the paper a case study for A350 flight control actuation system is presented to testify the application of this methodology. Compared to the traditional hydraulic architecture, the optimal architecture is more competitive in weight, power and cost. At the same time, the optimal architecture is found in less than 30 minutes among 1075 candidates, which greatly reduces the design cycle. This method deals with the problem in the design of flight control actuation system. Abstract: Publication date: June 2019Source: Aerospace Science and Technology, Volume 89Author(s): Xiaolin Ai, Jianqiao Yu This study proposes a flatness-based fixed-time sliding mode control strategy to address the trajectory tracking problem for a quadrotor with external disturbances. Based on the differential flatness theory, the underactuated dynamics of the quadrotor is converted to four fully-actuated subsystems. As the velocity information of the desired trajectory cannot be obtained directly in some practical applications, a fixed-time state observer is presented to estimate the velocity of the desired trajectory. In order to enhance the system's robustness, a fixed-time disturbance observer is also constructed to estimate and compensate the lumped disturbances. Based on the fixed-time state observer and disturbance observer, the backstepping technique is utilized to perform the sliding mode controller design process, where a fixed-time differentiator is presented to estimate the virtual control inputs to avoid the problem of “explosion of complexity” suffered by the typical backstepping. The stability analysis is conducted to demonstrate the uniformly ultimately bounded stabilization of the closed-loop system with fixed-time convergence regardless of the initial conditions. Finally, the simulation results validate the superior performance of the proposed control scheme. Abstract: Publication date: Available online 5 April 2019Source: Aerospace Science and TechnologyAuthor(s): Kunlin Cheng, Jiang Qin, Hongchuang Sun, Chaolei Dang, Silong Zhang, Xiaoyong Liu, Wen Bao Hypersonic vehicle as next generation aircraft/spacecraft has broad applications, but its power supply and refrigeration are strictly limited by finite cold source. In this article, an integrated power generation and refrigeration system is developed, in which low-temperature fuel is utilized as cold source and high-temperature fuel is used as heat source. A novel combined generator based on closed-Brayton-cycle (CBC) and thermoelectric generator (TEG) is proposed to enhance electric power through extending the available temperature range of cold source. The integrated system model which consists of a refrigerator, a simple recuperated CBC and a three-stage TEG, is established to assess performance. Results indicate that the combined CBC-TEG generator has great potential in electric power enhancement. The power has an increase of 18.2% compared with single CBC. Power increase percentage of combined generator reduces with fuel outlet temperature in primary cooler. Moreover, decoupling the cooling and heating process of the combined generator is beneficial for the matching between its cold source and heat source. This research provides an innovative technical solution for the power generation and refrigeration on hypersonic vehicles under finite cold source conditions. Abstract: Publication date: Available online 5 April 2019Source: Aerospace Science and TechnologyAuthor(s): Yu Wu, LeiLei Li, Xichao Su, Bowen Gao Unmanned aerial-aquatic vehicle (UAAV) is a new type of aircraft that can navigate both in air and underwater. Considering that the diving motion of UAAV plays an important role in the performance of UAAV and is under exploration, the dynamics modeling and trajectory optimization problem are studied in this paper. The UAAV model used in this study is introduced firstly, and folded wings are adopted to reduce the drag in the diving process. Among the forces imposed on UAAV, fluid force is the most complicated and is calculated by the forces induced by ideal fluid and viscous fluid respectively. Based on the established dynamic model, the diving process is regarded as a free motion to avoid the instability during the control switch between air and water. Therefore, the trajectory of UAAV is determined by the initial states of diving process. To obtain the satisfactory trajectory under certain optimization index, an adaptive and global-best guided CS algorithm, named as improved cuckoo search (ICS) algorithm, is developed to strength the exploitation ability and search efficiency. Simulation results demonstrate that the established dynamical model of UAAV is rational and can reflect the characteristic of the diving motion. The proposed ICS algorithm performs better than the particle swarm optimization (PSO) algorithm and the standard CS algorithm both in optimizing the elapsed time of diving process and the terminal position error. Abstract: Publication date: Available online 5 April 2019Source: Aerospace Science and TechnologyAuthor(s): S.M. Frolov, V.S. Aksenov, V.S. Ivanov, I.O. Shamshin, A.E. Zangiev The air-breathing pulsed detonation thrust module (TM) for an aircraft designed for a subsonic flight at a speed of up to 120 m/s when operating on a standard aviation kerosene was developed using the analytical estimates and parametric multivariant three-dimensional (3D) calculations. The TM consists of an air intake with a check valve, a fuel supply system, a prechamber-jet ignition system and a combustion chamber with an attached detonation tube. An experimental sample of TM was fabricated, and its firing tests were carried out on a test rig with a thrust-measuring table. In firing tests, TM characteristics are obtained in the form of dependencies of effective thrust, aerodynamic drag and fuel-based specific impulse on fuel consumption at different speeds of the approaching air flow. It has been experimentally shown that the fuel-based specific impulse of the TM reaches 1000-1200 s, and the effective thrust developed by it reaches 180–200 N.
Abstract: Publication date: Available online 4 April 2019Source: Aerospace Science and TechnologyAuthor(s): Bingheng Wang, Zhongjie Meng, Cheng Jia, Panfeng Huang Removal of the tumbling targets using tethered space robots is subject to the risk of tether tangling around the targets. A good anti-tangle control should be (1) fuel-saving, (2) implementation-friendly and (3) tether-libration-suppressing. The proposed strategy achieves these requirements by using a linear actuator to move the tether offset. However, the underactuation due to the input constraints and coupling arises as a main technical challenge. We address the issue from the system passivity viewpoint by constructing the potential energy in terms of the tension torque. This makes the most of the tether characteristic whereby we specify the control objective that steers the target's angular velocity to the tether direction. Then, an energy-based sliding mode motion controller is designed, the parameter of which is optimized using a model predictive controller to satisfy the motion constraint. The tangle-avoidance is further reinforced by adaptively tuning the weight of MPC. A RBF neural network and a extended Kalman filer are also used to render the controller robust to the uncertainties. Simulations with different tumbling rates validate the effectiveness of the method. Abstract: Publication date: Available online 4 April 2019Source: Aerospace Science and TechnologyAuthor(s): Yuxi Luo, Fengbo Wen, Shuai Wang, Shibo Zhang, Songtao Wang, Zhongqi Wang In this study, the structure of a harbor seal vibrissa, or whisker, is applied to the trailing edge of a high subsonic turbine blade to reduce wake loss. A method of generating biomimetic geometry is provided. In order to study the mechanism of wake loss reduction for the biomimetic trailing edge, four trailing edge shapes are studied numerically: with circular (prototype blade), elliptic, sinusoidal and biomimetic. The delayed detached-eddy simulation (DDES) approach is used to predict the flow details around the blades. Results show that a substantial reduction of mixing loss is obtained for the blade with a biomimetic trailing edge. The coherent structures of Karman vortices are completely suppressed and transformed into smaller vortices with distinct three-dimensional characteristics owing to the influence of biomimetic trailing edge. Such small vortices dissipate quickly during the mixing with the mainstream, so the wake area for biomimetic trailing edge case is much narrower, and the velocity in the wake recovers more quickly compared with the situation in the other three cases. The vortices shedding from the suction side and pressure side move from the geometric peaks to the valleys when moving downstream. Abstract: Publication date: Available online 4 April 2019Source: Aerospace Science and TechnologyAuthor(s): Zhenhua Li, Bing He, Minghao Wang, Haoshen Lin, Xibin An Considering the requirements of saturation attack, a time-coordination entry guidance algorithm for multi-hypersonic vehicles is proposed in this paper, which is composed of three parts: generation of coordination time, predictive lateral guidance based rough adjustment of reentry flight time and longitudinal predictor-corrector guidance based time coordination. Firstly, the coordination flight time is generated by analyzing the time range of entry flight for each hypersonic vehicle. Next, in the lateral profile, the predictive lateral guidance is employed to roughly adjust the reentry flight time of the vehicle, and provide feasible time range of coordinative flight for longitudinal predictor-corrector guidance. In the longitudinal profile, a quadratic bank angle magnitude profile is designed and adjusted by the Newton iteration scheme to meet the range and time constraints, and realize the time-coordination entry guidance for multi-hypersonic vehicles. As the impacts of the lateral motion and longitudinal motion on entry flight time are both considered, the proposed algorithm greatly extends the feasible time range of coordinative flight, which is more suitable for engineering practice. Finally, the feasibility and robustness of the proposed time-coordination entry guidance algorithm are tested and verified by the multi-mission and multi-vehicle guidance simulations. Abstract: Publication date: Available online 4 April 2019Source: Aerospace Science and TechnologyAuthor(s): Hasan Keshavarzian, Kamran Daneshjoua In ground effect conditions, the wake of Quad-copter rotors interacting with the ground causes significant perturbation to the flow near the rotor blades, as well as to the body. These interactions have serious effects on the handling qualities and cause instability in flight. Most studies in the ground effect are focused on hover and landing capabilities of rotorcraft. In this paper, a comprehensive non-linear model of quadrotor is provided in the state-space, which is suitable for all flight types near the ground. First of all, it is tried to add a ground surface quality coefficient in modified ground effect relation by experimental investigations. The experiments have been done in outdoor during calm days with no wind. In the next step, a robust non-linear control strategy is designed based on the modified model. The effects of ground effect and the increase of the advance ratio are then investigated on controller performance. The simulation results show that this model is closer to the actual flight conditions and the stability and the trajectory tracking are significantly improved by implementation of this control strategy. So, this strategy provides an appropriate platform to run other methods without the need for iterative learning techniques and high battery energy consumption. Abstract: Publication date: Available online 3 April 2019Source: Aerospace Science and TechnologyAuthor(s): Nader H. Al-Battal, David J. Cleaver, Ismet Gursul Counter-flowing wall jets actuated on the upper surface of an airfoil are investigated for the purpose of controlling gust encounters. For periodic and transient actuations, phase-averaged lift force and particle image velocimetry measurements are presented for a NACA 0012 airfoil, at a Reynolds number of 660,000, for a range of reduced frequencies and three jet locations, xJ/c=0.08, 0.60 and 0.95. For periodic actuation, amplitude of lift oscillations decrease and phase delay increase with increasing reduced frequency. The effect of reduced frequency on the amplitude and phase is more significant for blowing locations near the leading-edge and with increasing angle of attack. Transient actuation reveals the slow response of the separated flow, and therefore lift, with the delay becoming more pronounced for blowing near the leading-edge. Estimated time constants are similar to previous observations for forced separation and reattachment. Abstract: Publication date: Available online 3 April 2019Source: Aerospace Science and TechnologyAuthor(s): Stavros Vouros, Ioannis Goulos, Vassilios Pachidis This paper presents an integrated approach for the aeroacoustic assessment of four-dimensional rotorcraft operations. A comprehensive rotorcraft code is utilized to model aircraft flight dynamics across complete missions. A free-wake aero-elastic rotor model is employed to predict high-resolution unsteady airloads, including blade-vortex interactions, at each mission element. A rotor aeroacoustics code is developed to calculate source noise and far-field ground acoustic impact. Time-domain acoustic formulations are used to evaluate near-field noise generation across designated acoustic spherical surfaces surrounding the helicopter main rotor. A numerical procedure is developed for the derivation of acoustic spheres on-the-fly, coupled with trajectory-adaptive ground observer grids. The individual analytical models are incorporated into a mission analysis numerical procedure. The applicability of the integrated method on “real-world” rotorcraft operations is demonstrated for two generic, four-dimensional missions, without the need of pre-stored noise data. The proposed approach provides insight into helicopter noise prediction at mission level, elaborating on the coupling of aeroelastic rotor response with rotorcraft flight dynamics and aeroacoustics. Abstract: Publication date: Available online 2 April 2019Source: Aerospace Science and TechnologyAuthor(s): Zhengyuan Wu, Zhenxun Gao, Chongwen Jiang, Chunhian Lee Delayed detached eddy simulation (DDES) studies of the highly unsteady supersonic cavity-ramp flow have been successfully carried out. It is generally believed that accurate prediction of the compressible unstable shear layer coupled with the followed reattaching process is a big challenge for DDES method. In the current DDES studies based on an engineering affordable mesh, significant improvements are achieved assessed by the agreements with experimental data. Effects of various crucial parameters related to DDES have been analyzed in detail. First of all, it is found that a fine mesh with sufficient computation domain is required to obtain accurate results, and the time step needs to be properly set. Secondly, effect of the definition of subgrid length scale Δ is observed, especially in the initial region of shear layer. The original Δ form of DDES method tends to depress the development of instabilities in the shear layer. Analysis on the physical causes is presented. Moreover, unexpected performance of DDES' shield function fd for the current case is observed and analyzed, whose influence on the simulated characteristic in the downstream region has also been discussed in particular. Abstract: Publication date: Available online 2 April 2019Source: Aerospace Science and TechnologyAuthor(s): John J. Otter, Tomasz Stańkowski, Matthew Robinson, David G. MacManus Without careful consideration of aerodynamic installation effects on exhaust system performance the projected benefits of high bypass ratio engines may not be achievable. This work presents a computational study of propulsion system integration in order to quantify the effect that aircraft installation has on the aerodynamic performance of separate-jet aero-engine exhaust systems. Within this study the sensitivity of exhaust nozzle performance metrics to aircraft incidence and under wing position were investigated for two engines of different specific thrust. Upon installation, thrust generation was found to be beneficial or detrimental relative to an isolated engine depending on the position of the engine relative to the wing leading edge. The dominant installation effect was observed on the exhaust afterbodies and, over the range of engine positions investigated at cruise conditions, the installed modified velocity coefficient was shown to vary up to 1% relative to an isolated engine. Furthermore, due to variations in the core nozzle mass flow rate by up to 10% relative to an isolated engine, it is concluded that aerodynamic installation effects need to be taken into consideration when sizing the core nozzle in order to ensure engine operability. Abstract: Publication date: Available online 2 April 2019Source: Aerospace Science and TechnologyAuthor(s): Luyao Zang, Defu Lin, Siyuan Chen, Hui Wang, Ji Yi An on-line guidance algorithm is presented for high L/D hypersonic reentry vehicles using plane-symmetry bank-to-turn control method. The proposed guidance algorithm can generate a feasible trajectory at each guidance cycle during the reentry flight. In the longitudinal profile, height-range (H-R) and height-velocity (H-V) joint design method is proposed to rapidly generate the reference trajectory and the controlled bank angle to satisfy all constraints. Then, the quasi-equilibrium glide phenomenon is employed to extract the other controlled angle of attack corresponding to the reference trajectory. In the lateral profile, the bank angle reversal strategy is designed according to the cross-range angle threshold and the proportional navigation approach to reduce heading error. Simulation results for nominal and dispersed cases show that the proposed guidance algorithm is capable of generating a feasible trajectory rapidly that satisfies both path and terminal constraints. Abstract: Publication date: Available online 2 April 2019Source: Aerospace Science and TechnologyAuthor(s): Zixuan Zheng, Jian Guo, Eberhard Gill The increasing number of satellites for specific space missions is hindering efficient control from the ground stations. In addition, the risk of failing or deteriorating elements in a multi-satellite system (MSS) leads to the uncertainty in its operating environment which challenges traditional centralized planning algorithms. Centralized algorithms depend on one coordinator to overview entire system, which is a single poitn of failure, so if it malfunctional, the MSS may go down. To overcome this problem, a distributed onboard mission planning algorithm based on the Hybrid Dynamic Mutation Genetic Algorithm (HDMGA) is proposed for such MSS. The satellites are considered as autonomous agents which can communicate and negotiate with other satellites. The mission objective is decomposed through the team negotiation procedures, and the local goals are dispatched to the participant satellite. The local planning procedure on each satellite is modeled as local search problems, while the planning problem for entire team is formulated as strongly-coupled distributed optimization problem. The verification shows that the proposed distributed approach can achieve the same results as the centralized approach. The simulation results illustrate that the proposed approach shows superior performance on both computation time and success rate, as compared with other two state-of-the-art distributed mission planning approaches. Abstract: Publication date: Available online 1 April 2019Source: Aerospace Science and TechnologyAuthor(s): Majie Zhao, Yifan Bian, Qinling Li, Taohong Ye In this paper, large eddy simulation of transverse sonic single/double hydrogen jets into supersonic Mach 2 crossflow have been carried out to investigate the complex flow structures and the mixing performance. Detailed turbulence characteristics, in terms of the instantaneous and mean flow fields, the vortex structures and their evolutions, the turbulence kinetic energy and the Reynolds shear stress distributions, the maximum hydrogen mass fraction and jet penetration, have been provided. Results of the two-dimensional and three-dimensional streamlines illustrate that the trailing counter-rotating vortex pairs (TCVP), the secondary TCVP of primary jet and the horseshoe vortex can merge and form a new horseshoe vortex. Three counter-rotating vortex pairs (CVP) are formed in the downstream of secondary jet: the CVP-B due to interactions between the supersonic crossflow and secondary jet; the CVP-C due to interactions between the supersonic crossflow, primary and secondary jets; and the CVP-D due to interactions of the supersonic crossflow and primary jet. The presence of primary jet flow alters the Reynolds shear stress distributions after the secondary injection with the influence of these large-scale structures. In addition, the two-stage jet injection system is proved to yield a better mixing performance than the single jet system. Abstract: Publication date: Available online 1 April 2019Source: Aerospace Science and TechnologyAuthor(s): Chanhee Moon, Hyunduk Seo, Man Yeong Ha, Sang Youl Yoon, Kyung Chun Kim Fuel icing of fuel/oil heat exchange systems has been a troublesome issue. In this study, a de-icing method is proposed to manage the fuel icing problem by switching the fuel flow direction of the systems. This method uses the fuel/oil heat exchanger as a passive heat source, heat and momentum of the fuel are delivered to the ice. A device named FFDSD (Fuel flow direction switching device) has been developed for this method. This device consists of two normally open and two closed type solenoid valves, and the proposed configuration consumes electrical power only when switching fuel flow directions (36 W to 0 W). A control algorithm has been developed as a countermeasure against a large amount of ice inflow that conventional methods cannot cope with. FFDSD was designed and fabricated, and the experimental test was conducted. The experimental results show that the proposed method can successfully achieve the de-icing of the fuel system within 1 s. A numerical de-icing process was attempted. Ice in fuel was numerically modeled as a fluidized quasi-solid material based on descriptions in previous studies. Numerical analysis results show a similar tendency to experimental results. The results of this study would be useful to manage fuel icing problem of heat exchange systems. Abstract: Publication date: Available online 1 April 2019Source: Aerospace Science and TechnologyAuthor(s): Mehmet Karaca, Song Zhao, Ivan Fedioun, Nicolas Lardjane This paper presents and discusses Implicit Large Eddy Simulation (ILES) results of vitiation effects in ground tests of supersonic air/H2 combustion. This work is useful for realistic extrapolation of ground test data to flight conditions. The high-enthalpy flow configuration retained, typical of scramjet engines, is the Mach 2 LAERTE combustion chamber of the French aerospace lab ONERA. The supersonic air co-flow is preheated by burning a small amount of hydrogen in oxygen-enriched air. Stable numerical simulations of such high-speed turbulent shocked flows require dissipative numerics that interact with molecular diffusion. The premature ignition in the case of vitiation by oxygen atom can be observed using reduced finite rate chemistry in the quasi-laminar approximation, i.e. without any subgrid combustion model, because the Damköhler number (ratio of turbulent to chemical time scale) is less than unity. Turbulent time scales are only moderately affected by vitiation, but chemical time scales are significantly reduced. Abstract: Publication date: Available online 1 April 2019Source: Aerospace Science and TechnologyAuthor(s): A. Voß This work presents results of dynamic “one-minus-cosine” gust load simulations for a flying wing configuration. The in-house toolbox Loads Kernel is used for the loads analysis of the free flying aircraft. Flight mechanical characteristics are captured by application of a non-linear equation of motion in the time domain. The underlying aerodynamic methods are the Vortex Lattice and the Doublet Lattice Method with a rational function approximation (RFA) for unsteady simulations in the time domain. The structural model was created using DLR's parametric ModGen/Nastran design process. The structure is optimized for minimum structural weight with typical design load cases including maneuver, gust and landing loads. In this article, the focus lies on gust encounters and the flight characteristics of a flying wing configuration. It differs from classical configurations (wing-fuselage-empennage) due to a pronounced nose-up pitching motion when the aircraft enters the gust field. Finally, a flight controller is designed to increase the pitching stability. This is essential for the flight of a naturally unstable configuration. It is shown that the loads during a gust encounter increase significantly. The influence on the structural weight is small as the layout is very robust and the required material thickness is below the minimum thickness in most areas. Abstract: Publication date: Available online 30 March 2019Source: Aerospace Science and TechnologyAuthor(s): Peixu Guo, Zhenxun Gao, Zhengyuan Wu, Hongpeng Liu, Chongwen Jiang, Chunhian Lee One of the current problems of the detached eddy simulation (DES) and delayed DES (DDES) methods is the inaccuracy in prediction of the separated shear layer flows, which mainly reflects in the delayed development of the shear layer. To correctly simulate the separated shear flow, various modified definitions of the DDES length scale are investigated and the improved definition of the subgrid eddy viscosity is introduced to deal with the delayed development problem for the first time. In this paper, the shear layer without the upstream boundary layer is studied in order to assess the subgrid model of the DDES in the simulation of shear layers. Large eddy simulation (LES) and experiment results are introduced to test the performance of different definitions of the DDES parameters. According to the results, both the definitions of the length scale and subgrid eddy viscosity coefficient should be improved to get the best prediction. DDES with the LES length scale and vorticity-correlated length scale as well as the modified definition of the subgrid eddy viscosity coefficient predict a more accurate development of the shear layer than DDES with the original definitions, which provides a possible solution to the delay development problem of the shear layer. Furthermore, the LES mode of DDES performs considerably differently from the Smagorinsky-LES, which shows the former subgrid model is essentially different from that of Smagorinsky-LES. Theoretical analyses are made in order to find out the quantitative difference of the subgrid eddy viscosity between the LES mode of DDES and Smagorinsky-LES. Abstract: Publication date: Available online 28 March 2019Source: Aerospace Science and TechnologyAuthor(s): Ioannis Goulos, Marco Bonesso The concepts of variable rotor speed and active blade twist constitute promising technologies in terms of improving the operational performance and environmental impact of rotorcraft. Modern civil helicopters typically operate using nearly constant main and tail rotor speeds throughout their operational envelope. However, previous research has shown that decreasing the main rotor speed within salient points of the operational envelope can result in a notable reduction of rotor power requirement, resulting in more efficient aircraft. This work aims to develop an integrated approach able to evaluate the potential improvements in fuel economy and environmental impact through optimum implementation and scheduling of variable rotor speed combined with active blade twist. A comprehensive rotorcraft analysis method is utilized, comprising models applicable to flight dynamics, rotor blade aeroelasticity, engine performance, gaseous emission prediction, and flight path analysis. A holistic optimization strategy comprising methods for Design of Experiment (DOE), Gaussian Process-based (GP) surrogate-modeling, and genetic optimization is developed. The combined framework is used to predict globally optimum variable rotor speed and active blade twist schedules resulting in minimum fuel consumption. The overall method is employed to assess the impact of the investigated concepts for a representative Twin-Engine Light (TEL) helicopter operating within realistic mission scenarios. The optimizations carried out suggest that variable rotor speed combined with active blade twist may result in mission fuel consumption and nitrogen oxides emission (NOx) reductions of the order of 5% and 8%, relative to the fixed rotor speed case. The developed method constitutes an enabling technology for the investigation of novel technologies at multiple levels of assessment including aircraft-engine and mission levels. Abstract: Publication date: Available online 27 March 2019Source: Aerospace Science and TechnologyAuthor(s): Jiang Runpei, Tian Yun, Liu Peiqing The transonic buffet over large aircraft wings seriously affects flight safety and ride quality, thus it has been a focus issue for researchers to control transonic buffet through active or passive means. With traditional supercritical airfoil and wing, shock foot bubble and trailing edge separation usually exist in the pre-buffet conditions. The merging of the shock foot bubble and trailing edge separation is associated with buffet onset. In order to prevent shock foot bubble from merging with the trailing edge separation, this paper presents a method to alleviate the transonic buffet by applying the Buffet Breather, which is made of a punched hole near the trailing edge at the RAE2822 airfoil and Wing1 supercritical wing published by Drag Prediction Workshop-III, respectively. The buffet characteristics of the airfoil and wing with and without the Buffet Breather are analyzed with Unsteady Reynolds Averaged Navier-Stokes method. The results show that the Buffet Breather can not only eliminate the buffet phenomenon under two-dimensional condition, but also weaken the pressure oscillation on the wing. In terms of the static aerodynamic characteristics, the Buffet Breather will reduce the lift coefficient under lower angle of attack and deteriorate the lift-to-drag ratio. In the actual application, a control valve can be considered to be installed, to open and close the Buffet Breather in order to achieve the best control effect. Abstract: Publication date: Available online 27 March 2019Source: Aerospace Science and TechnologyAuthor(s): Jacopo Serafini, Giovanni Bernardini, Roberto Porcelli, Pierangelo Masarati This paper presents an original approach to structural health monitoring of helicopter rotors based on strain measurement on the blades. Three algorithms are presented, one in the time domain and two in the frequency domain. They are based on the analysis of the discrepancies between the strains on damaged and undamaged blades. Two damage types are considered: a mass unbalance at the tip, and a localized stiffness reduction. The performance of the proposed methods is assessed by numerical simulation using a multibody dynamic solver for comprehensive aeroelastic analysis of rotorcraft. The numerical investigation has highlighted the capability of all the presented techniques to detect damages in the blades, even of small entity, in both steady-flight and soft maneuvers. The reduced prediction accuracy in aggressive maneuvered flight suggests the use of these methods only in steady or quasi-steady flight conditions. Abstract: Publication date: Available online 27 March 2019Source: Aerospace Science and TechnologyAuthor(s): Yushu Jin, Xu Xu, Qingchun Yang, Shaohua Zhu Much attention has been drawn to liquid-propellant rocket engine with thrust that can be varied on demand in recent years. A GO2/kerosene deep-throttling variable thrust rocket engine using the newly proposed gas-liquid pintle injector is presented. Three-dimensional numerical simulations are conducted to investigate the flame appearance and heat flux distribution of the engine. The SST k-omega model are used for modeling turbulence and single-step finite-rate kinetics are used for modeling combustion. A grid sensitivity study is performed to examine the validity of the simulation results. The effects of total mass flow-rate, kerosene droplet injection velocity and kerosene droplet size distribution on flame appearance and heat flux distribution of the combustor are studied in detail. Three entirely different flame appearances are observed and it correspondingly causes different heat flux distributions. Details of the flow field structure and mass fraction contour inside the combustor are discussed to explore the cause of heat flux distribution. The work will provide a reference for the design of thermal protection system of the variable-thrust rocket engine operating with a wide range of space. Abstract: Publication date: Available online 25 March 2019Source: Aerospace Science and TechnologyAuthor(s): Hodei Urrutxua, Claudio Bombardelli, José Manuel Hedo The “ion-beam shepherd” (IBS) is a contactless active space debris removal technique, also applicable to asteroid deflection. In the design of an IBS mission many constraints need to be considered, which involve multiple trade-offs. These constraints can be expressed analytically as a function of certain design parameters, and conveniently displayed in a two-dimensional parameter space or design space. This construction yields a “matching chart”, which effectively provides a feasible design envelope, and enables to find graphically a suitable design point that satisfies all applicable operational constraints simultaneously, thus providing a powerful tool tailored for the preliminary design of an IBS mission. Abstract: Publication date: Available online 22 March 2019Source: Aerospace Science and TechnologyAuthor(s): Teng Lyu, Yanning Guo, Chuanjiang Li, Guangfu Ma, Haibo Zhang To solve the problem of multiple missiles under directed communication topologies attacking a stationary target simultaneously in desired relative line-of-sight (LOS) directions in plane, a cooperative guidance law with two components in the LOS frame for multiple missiles is proposed. Based on missiles-target relative motion equations in plane, a time and space cooperative guidance model of multiple missiles is constructed. Based on multi-agent cooperative control theory, in LOS direction, one distributed time-cooperative guidance law is designed, which can guarantee all missiles' impact times achieve consensus asymptotically. In vertical direction of LOS, one distributed space cooperative guidance law is designed, which can guarantee missiles' relative LOS angles converge to desired values asymptotically. Numerical simulations demonstrate that the proposed cooperative guidance law can make multiple missiles attack the target simultaneously in desired relative LOS directions. Abstract: Publication date: Available online 22 March 2019Source: Aerospace Science and TechnologyAuthor(s): Jianbo Zhao, Shuxing Yang, Fenfen Xiong Based on the centralized leader-follower framework, a novel cooperative guidance strategy is proposed to implement the fire-and-forget attacks of seeker-less missiles in which the motion information of a maneuvering target and the strict requirement on the convergence time of the position are not required for the seeker-less missile. First, based on the motion states of two seeker-guided missiles, a virtual target (a point or line) that can certainly arrive at or cover the maneuvering target is carefully selected. Then, two cooperative guidance laws corresponding to the point and line virtual target are derived based on the consensus theory and dynamic inversion control, respectively. One of the guidance laws can implement the simultaneous attack of multiple missiles by employing both normal and tangential overloads, while the other is more practical to be employed as it only controls the normal overload of the seeker-less missile, even though the simultaneous attack cannot be implemented. Simulations are conducted, and the impact of the guidance parameters on the guidance performance is also studied. The results demonstrate the effectiveness of the proposed cooperative guidance laws. Abstract: Publication date: Available online 22 March 2019Source: Aerospace Science and TechnologyAuthor(s): Minghui Sun, Krista Rand, Cody Fleming This paper systematically investigates the safety implications of a new 4-dimensional air traffic management paradigm by quantitatively identifying conditions where conflict-free trajectories can be guaranteed by only using 4-dimensional waypoints. Towards this end, a concept called Trajectory Inclusion is first introduced based on geometry and physics-driven proofs and analysis. Strategies to achieve conflict-free trajectories are then developed and further explained with a leader–follower example. It is found out that the time-based waypoints alone can guarantee conflict-free trajectories if certain initial conditions are satisfied. In general, the results of this paper enhance the understanding of time-based management capabilities, and help formulate better time-based instructions to reduce unnecessary tactical maneuvers and improve the overall performance of the airspace, one of the main promises Trajectory Based Operations (TBO). Specifically, the algorithmic scheme created for the leader–follower example can be applied directly to Flight-deck Interval Management, a future concept of TBO. Abstract: Publication date: Available online 21 March 2019Source: Aerospace Science and TechnologyAuthor(s): Mohammad Sharifi Ghazijahani, Mehmet Metin Yavuz The effect of thickness-to-chord (t/C) ratio on aerodynamics of a non-slender delta wing with sweep angle of 45 degree is characterized in a low-speed wind tunnel using laser illuminated smoke visualization, surface pressure measurements, particle image velocimetry, and force measurements. The delta wings of t/C ratios varying from 2% to 15% with 45 degree windward beveled leading edges are tested. The results indicate that the effect of t/C ratio on flow structure is quite substantial. Considering the low angles of attack where the wings experience leading edge vortex structure, the strength of the vortex structure increases as the t/C ratio increases. However, low t/C ratio wings have pronounced surface separations at higher angle of attack compared to the wings with high t/C ratios. These results are well supported by the force measurements such that high t/C ratio wings induce higher lift coefficients, CL, at low angles of attack, whereas maximum CL values are higher and appear at higher angle of attack for low t/C ratio wings. This indicates that low t/C ratio wings are more resistive to the stall condition. Considering the lift-to-drag ratio, CL/CD, increase in t/C ratio induces remarkable drop in CL/CD values. Abstract: Publication date: Available online 20 March 2019Source: Aerospace Science and TechnologyAuthor(s): X. Mao, P.N.A.M. Visser, J. van den IJssel Baseline determination for the European Space Agency Swarm magnetic field mission is investigated. Swarm consists of three identical satellites -A, -B and -C. The Swarm-A and -C form a pendulum formation whose baseline length varies between about 30 and 180 km. Swarm-B flies in a higher orbit, causing its orbital plane to slowly rotate with respect to those of Swarm-A and -C. This special geometry results in short periods when the Swarm-B satellite is adjacent to the other Swarm satellites. Ten 24-hr periods around such close encounters have been selected, with baseline lengths varying between 50 and 3500 km. All Swarm satellites carry high-quality, dual-frequency and identical Global Positioning System receivers not only allowing precise orbit determination of the single Swarm satellites, but also allowing a rigorous assessment of the capability of precise baseline determination between the three satellites. These baselines include the high-dynamic baselines between Swarm-B and the other two Swarm satellites.For all orbit determinations, use was made of an Iterative Extended Kalman Filter approach, which could run in single-, dual-, and triple-satellite mode. Results showed that resolving the issue of half-cycle carrier phase ambiguities (present in original release of GPS RINEX data) and reducing the code observation noise by the German Space Operations Center converter improved the consistency of reduced-dynamic and kinematic baseline solutions for both the Swarm-A/C pendulum pair and other combinations of Swarm satellites. All modes led to comparable consistencies between the computed orbit solutions and satellite laser ranging observations at a level of 2 cm. In addition, the consistencies with single-satellite ambiguity fixed orbit solutions by the German Space Operations Center are at comparable levels for all the modes, with reduced-dynamic baseline consistency at a level of 1-3 mm for the pendulum Swarm-A/C formation and 3-5 mm for the high-dynamic Swarm-B/A and -B/C satellite pairs in different directions. Abstract: Publication date: Available online 20 March 2019Source: Aerospace Science and TechnologyAuthor(s): Supriya Devi, K.V. Nagaraja, T.V. Smitha, Sarada Jayan This paper presents automatically generated higher order curved triangular meshes around airfoil design using MATLAB code. This work shows a valuable basis for the finite element procedures involved in evaluating aerodynamic performances. Finite element method (FEM) effectively solves all computational fluid dynamics problems around the airfoil and for that region around the airfoil that has been discretized with unstructured curved triangular elements. Meshes have been formed on the basis of subparametric transformation created for the curved triangular element obtained from the nodal relations of parabolic arcs. This scheme can be used to obtain the output data of node coordinates, element connectivity and boundary values for all discretized elements over the airfoil design. A spectacular work done on linear triangular element meshing over a domain by Persson and Gilbert Strang is the basis of present meshing scheme. The proposed meshing scheme presents a refined higher order (HO) curved triangular discretization of few airfoil designs namely NACA0012, NACA0015 and NACA0021 inscribed inside a circle. The approach of the suggested meshing scheme described in this paper can be applied to numerous aerospace applications such as computing pressure gradients, understanding atmospheric nature study, evaluating laminar viscous compressible flow around the airfoil shape, etc. The element and nodal information gained from this discretization is useful for the numerical solutions of FEM and for the aerodynamic portrayal. This paper is aimed at the innovative discretization scheme which can be extended to all kinds of NACA airfoil designs. We have provided the MATLAB code AirfoilHOmesh2d for HO curved meshing around an airfoil with a cubic order triangular element. The mathematical explanation of this along with the description and implementation of it on few airfoil designs is described. The flowchart of the MATLAB code for cubic order meshing over airfoil design has been provided. This implementation supports many applications in an aerodynamic performance that have been elaborated in this paper. Two applications for the analysis of potential flow around airfoil and computation of pressure coefficient (Cp)on the surface of the airfoil design have been performed. It has been verified and found that the present HO curved meshing technique efficiently gives converging solution. Abstract: Publication date: Available online 20 March 2019Source: Aerospace Science and TechnologyAuthor(s): Giuseppe Petrone, Giacomo Melillo, Aurelio Laudiero, Sergio De Rosa Comfort plays an increasingly important role in the interior design of airplanes. In general, comfort is defined as ‘freedom from pain, well-being’; in scientific literature, indeed, it is defined as a pleasant state of physiological, psychological and physical harmony between a human being and the environment or a sense of subjective well-being. Cabin noise in passenger aircraft is one of the comfort parameter, which creates straightaway discomfort when exceeding personal thresholds. In general the cabin noise varies by the seat position and changes with flight condition. It is driven by several source types, which are transmitted through different transfer paths into the cabin. In the forward area the noise is mainly dominated by the turbulent boundary layer described by pressure vortexes traveling along the fuselage surface.In this paper evaluation of the Sound Pressure level, for the medium-high frequency range, of an aircraft fuselage section at different stations and locations inside the cabin has been performed numerically by using Statistical Energy Analysis (SEA) method. Different configurations have been considered for the analysis: from the “naked” cabin (only primary structure) up to “fully furnished” (primary structure with interiors and noise control treatments) one. These results are essential to understand which are the main parameters affecting the noise insulation. Furthermore the Power Inputs evaluation has been determined to see the contribution of each considered aeronautic component on the acoustic insulation. Finally, the effect of a viscoelastic damping layer embedded in the glass window has been evaluated. Abstract: Publication date: Available online 18 March 2019Source: Aerospace Science and TechnologyAuthor(s): Gianluca Romani, Damiano Casalino The aim of this paper is to assess the accuracy, capabilities and computational performances of the Lattice-Boltzmann/Very Large Eddy Simulation Method to predict the unsteady aerodynamic loads, the rotor wake development and the noise radiation of helicopter rotors in strong Blade-Vortex Interaction conditions. The numerical flow solution is obtained by solving the explicit, transient and compressible Lattice-Boltzmann equation implemented in the high-fidelity CFD/CAA solver Simulia PowerFLOW®. The acoustic far-field is computed by using the Ffwocs-Williams & Hawkings integral solution applied to a permeable surface encompassing the whole helicopter geometry. The employed benchmark configuration is the 40% geometrically and aeroelastically scaled model of a BO-105 4-bladed main rotor tested in the open-jet anechoic test section of the German-Dutch wind tunnel in the framework of the HART-II project. In the present study, only the baseline operating condition of the experimental campaign, without Higher-Harmonic Control enabled, is considered. All simulations are performed by assuming a rigid blade motion, but a computational strategy based on a combination of a rigid blade pitching motion and a transpiration velocity boundary condition applied on the blade surface is employed to take into account the blade elastic deformation motion measured during the experiments. As expected, modeling the blade elastic deformation leads to more accurate predictions of control settings, unsteady air-loads and noise footprint. The effects of the computational grid on the aerodynamic and aeroacoustic prediction is documented as well. Abstract: Publication date: Available online 18 March 2019Source: Aerospace Science and TechnologyAuthor(s): Anmin Zhao, Hui Zou, Haichuan Jin, Dongsheng Wen A whole adaptive variable camber wing (AVCW) equipped with an innovative double rib sheet (DRS) structure is experimentally and numerically studied in this work. The DRS structure adopts the surface contact mode for the force transmission of changeable camber wing instead of the conventional rigid hinge joint contact. The whole AVCW design allows to adjust the shape of wing in a real-time at various flight conditions, which is of great interest for Unmanned Aerial Vehicle (UAV) applications. The flight-test experiments demonstrate that the total AVCW carrying the developed adaptive control system (ACS) can enhance UAV flight efficiency by 14.1% comparing to a traditional fixed-wing of Talon UAV. In addition, it indicates that employing the whole AVCW structure can sustain a larger flight load, without increasing the weight of entire wing structure except for the actuator device and adhesives, which is promising for future engineering applications. Abstract: Publication date: Available online 15 March 2019Source: Aerospace Science and TechnologyAuthor(s): Xiaomeng Yin, Bo Wang, Lei Liu, Yongji Wang In this study, hypersonic vehicle (HV) tracking control in the presence of uncertainties and external disturbance is investigated. As the exact bounds of uncertainties and disturbances are usually unknown during flight, a disturbance observer (DOB)-based gain adaptation high-order sliding mode control (HOSMC) method is proposed for HVs. To mitigate the chattering effect while maintaining strong robustness, a method combining the advantages of the DOB and gain adaptation is introduced into the HOSMC. The DOB is employed to estimate and reject the uncertainties and external disturbance. Additionally, an adaptive control law is developed to compensate for estimation errors. By combining the DOB and the adaptive HOSMC, the unnecessarily large gain for maintaining robustness is reduced; thus, the chattering is mitigated. The effectiveness of the proposed control method is validated via simulation, in which a strong robustness, high tracking performance, and reduced chattering effect are achieved under uncertainties and external disturbance. Abstract: Publication date: Available online 15 March 2019Source: Aerospace Science and TechnologyAuthor(s): Davide Cinquegrana, Raffaele Votta, Carlo Purpura, Eduardo Trifoni A facility characterization test campaign was performed for NASA in SCIROCCO Plasma Wind Tunnel, with increasing enthalpy and constant reservoir pressure. In the frame of numerical rebuilding of the experimental data, an important gap among measured and numerically predicted values of heat flux led to deep analyses the numerical methods and the models usually employed for test rebuilding. The Navier-Stokes model with chemical reacting non-equilibrium flows, denoted a lack of physical accuracy due to local rarefaction effects, as certified by means of the continuum breakdown parameter. Furthermore, the low stagnation pressure environment could influence the surface catalytic behaviour of the hemisphere copper probe, and the chemical contribution to the stagnation heat flux. At the end, a set of direct simulation Monte Carlo with partial catalytic behaviour of the probe was performed, in order to address both critical phenomena highlighted and close the gap with the measured heat fluxes, understanding the actual test chamber environment. Abstract: Publication date: May 2019Source: Aerospace Science and Technology, Volume 88Author(s): Seonghwi Jo, Yunho Choi, Hong Jip Kim Combustion instabilities are often-observed phenomena which take place in acoustically closed spaces such as combustion chambers in propulsion systems. These phenomena should be studied consistently because they can make considerable damage on the combustion chambers and even entire engine systems. Acoustic cavity has been widely used as a passive stabilization device to suppress these combustion instabilities. To elucidate damping capacity of acoustic cavity according to various geometric shapes, a well-known Rijke tube facility has been used to simply include the interaction of heat and acoustic field. The damping capacity has been evaluated quantitatively in terms of bandwidth and amplitude ratio. Present results showed that the acoustic cavities having large orifice area showed better damping capacity. But, in case of orifice length, the length above a certain value makes cavity volume and resultant acoustic stiffness too small, so the damping capacity was decreased above a threshold-like specific length. As for the number of cavities, the damping capacity increases with the number, but, in a certain number or more, the damping capacity has been attenuated and the significant increase of the capacity was not observed. In case of the acoustic cavities which were thought to have sufficient damping capacity, decay time has been measured to quantify the damping capability in time domain. The effect of orifice area on decay time was much higher than those of orifice length. These results from heat and acoustic field interaction through Rijke tube showed that the pure acoustic approach would be insufficient for the fine tuning of acoustic cavity, and further combustion tests would also be necessary to optimize the shapes of the cavity. Abstract: Publication date: Available online 15 March 2019Source: Aerospace Science and TechnologyAuthor(s): Feng Liu The task of Integrated Power and Attitude Control (IPAC) of a spacecraft can be implemented by Variable Speed Control Moment Gyros (VSCMGs). The Integrated Power and Attitude Control System (IPACS) singularity problem is the key factor for the spacecraft to successfully perform IPAC task, which can be overcome by rational designing steering law. The singularity characteristic and the steering law should be considered during the process of design parameters for the VSCMG cluster with IPACS task. There is no research report in this area at present. The steering results of weighted pseudo-inverse and null motion of Weighted Pseudo-Inverse with Null Motion (WPINM) can be canceled by each other under some certain condition. So the flywheel torque requirement of the WPINM steering law can be greatly increased, which is contradictory to the original design intention of the weighted matrix. A steering law with minimum requirement of flywheel power and torque is introduced from existing research result. Then, the constraint of the IPACS singularity problem and the SGCMGs singularity problem cannot be encountered during the whole process of IPAC task is given. At last, the parameters design problem of VSCMGs for the IPAC task is cast as a multi-objective optimization problem with minimum whole system power and maximum utilization ratio of flywheel momentum under the condition of consideration of the steering. The intelligent algorithm of Non-dominated Sorting Genetic Algorithm (NSGA) is used to solve the nonlinear multi-objective problem. The flywheel power can be greatly reduced by the new parameters design method. Abstract: Publication date: Available online 14 March 2019Source: Aerospace Science and TechnologyAuthor(s): Mingying Huo, Giovanni Mengali, Alessandro A. Quarta, Naiming Qi The aim of this paper is to propose a shape-based method in which the concept of Bezier curve is used to efficiently design the three-dimensional interplanetary trajectory of a spacecraft whose primary propulsion system is an Electric Solar Wind Sail. The latter is a propellantless propulsion concept that consists of a spinning grid of tethers, kept at a high positive potential by a power source and maintained stretched by the centrifugal force. The proposed approach approximates the time variation of the components of the spacecraft position vector using a Bezier curve function, whose geometric coefficients are calculated by optimizing the total flight time with standard numerical methods and enforcing the boundary conditions of a typical interplanetary rendezvous mission. The paper also discusses a geometrical approach to include, in the optimization process, the propulsive acceleration vector constraints obtained with the latest Electric Solar Wind Sail thrust model. Abstract: Publication date: Available online 14 March 2019Source: Aerospace Science and TechnologyAuthor(s): Chen Xu, Yijun Mao, Zhiwei Hu Various passive and active methods have been developed to control flow separation from bluff bodies. However, these methods require adjusting features of the solid surface, such as modifying its geometry or porosity, or applying external force or momentum. This paper develops an off-body-based method, without adjusting any features of the solid surface, for controlling the unsteady flow separation by fixing porous materials downstream of bluff bodies. Numerical study on flow past a circular cylinder at a subcritical Reynolds number is performed, and the result indicates that the added downstream porous material changes flow in the wake and re-laminarizes the turbulent flow around the curved cylinder surface, reducing the wall pressure fluctuation around the cylinder. therefore, the associated aerodynamic noise is reduced greatly. Abstract: Publication date: Available online 14 March 2019Source: Aerospace Science and TechnologyAuthor(s): Rodrigo C. Palharini, Wilson F.N. Santos A computational investigation has been carried out to examine a non-reacting rarefied hypersonic flow over cavities by employing the Direct Simulation Monte Carlo (DSMC) method. The work focuses on the effects on the aerodynamic surface quantities due to variations in the cavity length-to-depth (L/H) ratio. The results highlight the sensitivity of the heat transfer, pressure and skin friction coefficients due to changes to the cavity L/H ratio. The L/H ratio ranged from 1 to 4, which corresponds to the transition flow regime based on an overall Knudsen number KnL. The analysis showed that the aerodynamic quantities acting on the cavity surface rely on the L/H ratio. It was found that pressure load and heating load to the cavity surfaces presented peak values along the forward face, more precisely in the vicinity of the cavity shoulder. Moreover, these loads are much higher than those found in a smooth surface, for the conditions investigated. Abstract: Publication date: Available online 14 March 2019Source: Aerospace Science and TechnologyAuthor(s): Steven F.T. Apirana, Christopher M. James, Robert Eldridge, Richard G. Morgan, Steven W. Lewis The X2 expansion tube facility at The University of Queensland is capable of simulating entry into most of the planetary bodies in our solar system, producing test conditions with stagnation enthalpies in excess of 100 MJ/kg. Models used in X2 are typically made from steel and, consequently, manufacture is often constrained to conventional methods, with associated long lead times, and high cost. Through an experimental campaign, the survivability and applicability of Rapid Prototype models was investigated. Three prototyping methods were investigated; Selective Laser Sintering, Stereolithography, and Fused Deposition Modelling, and these were compared to a steel baseline. A computational stress analysis was used to design an internally hollow test model geometry. All models survived the experimental test-time, one was destroyed by the post-experiment flow. It was thought that test-models might ablate during the experimental test time and this was investigated by using filtered imaging to capture Cyanogen radiation occurring in the model's boundary layer. Ablation was seen in all Rapid Prototype models, most strongly observed in the Selective Laser Sintered and Acrilonitrile Butadiene Styrene models. These models may be suitable for the study of non-equilibrium radiative emission just behind the shock wave, or ablation phenomena in a model's boundary layer. Abstract: Publication date: Available online 14 March 2019Source: Aerospace Science and TechnologyAuthor(s): Natsuki Tsushima, Tomohiro Yokozeki, Weihua Su, Hitoshi Arizono In this paper, an integrated geometrically nonlinear aeroelastic framework to analyze the static nonlinear aeroelastic response of morphing composite wing with orthotropic materials has been developed. A flat plate/shell finite element, which can model plate-like wings, has been accommodated to model composite/corrugated panels to investigate effects of different laminate orientations and corrugations. A corotational approach is used to consider the geometrical nonlinearity due to large deformation produced by wing morphing. An unsteady vortex-lattice method is implemented to couple with the structural model subject to the large deformations. A homogenization method is also implemented to model corrugated panels as equivalent orthotropic plates. Individual structural, aerodynamic, and corrugated panel models, as well as the complete nonlinear aeroelastic framework, are verified. Numerical studies explore the static aeroelastic responses of a flat wing with composite/corrugated panels. This work helps to understand the nonlinear aeroelastic characteristics of composite/corrugated wings and demonstrates the capability of the framework to analyze the nonlinear aeroelasticity of such morphing wings. Abstract: Publication date: Available online 13 March 2019Source: Aerospace Science and TechnologyAuthor(s): Zhankui Song, Kaibiao Sun This paper investigates the trajectory tracking problem for a small coaxial-rotor unmanned aerial vehicle (CRUAV) with partial loss of actuator effectiveness. The CRUAV model is decomposed into a dual loop structure based on back-stepping design idea. First, certain performance function specified a priori by the designer is introduced into the position loop such that the original position tracking error is transformed into an equivalent constrained variable providing for the performance judgment of the position loop. Then, a fault-tolerant control scheme is proposed based on adaptive strategies for compensating the effect caused by various adverse factors. Subsequently, an attitude control loop is derived by incorporating adaptive compensation method. It is proved that the proposed dual-loop structure is able to guarantee the satisfaction of the pre-specified constraint on the transformed errors. Finally, the effectiveness and benefits of the design dual-loop control system are validated via computer simulation. Abstract: Publication date: Available online 13 March 2019Source: Aerospace Science and TechnologyAuthor(s): James T. Peace, Frank K. Lu A quasi-one-dimensional method of characteristics (MOC) model is developed to evaluate the single-cycle gasdynamic flow field and associated propulsive performance of a fully- and partially-filled pulse detonation engine (PDE), and PDEs equipped with diverging nozzles. A detailed description of the PDE thrust chamber flow field is provided to highlight the dominant gasdynamic wave processes encountered in a general single-cycle operation. The MOC model is developed using a simplified unit process approach with an explicit inverse time marching algorithm in order to readily construct the complex thrust chamber flow field along a predefined grid. A grid dependency study is carried out to determine the appropriate grid resolution for the purposes of minimizing computational expense and maximizing numerical accuracy. Lastly, the MOC model is validated with existing numerical and experimental performance data for PDEs operating with oxyhydrogen and hydrocarbon mixtures in both atmospheric and sub-atmospheric environments. It is shown that the current MOC model has good agreement with existing numerical and experimental data for a variety of PDE configurations and operating conditions. Abstract: Publication date: Available online 13 March 2019Source: Aerospace Science and TechnologyAuthor(s): Haitian Zhu, Wenxing Hao, Chun Li, Qinwei Ding, Baihui Wu The vertical axis wind turbines (VAWTs), as common wind turbines for harvesting wind energy, have wide prospects of development. However, the VAWTs are periodically influenced by dynamic stall which can cause the aerodynamic losses and load fluctuation. Therefore, the VAWTs urgently require flow control technique to improve the aerodynamic characteristics. The jet actuators, as active flow control (AFC) techniques, are reasonable implementations for VAWTs. The current paper presents the review of jet flow control techniques which have been used or are worth being used in VAWTs, including the blowing, synthetic and plasma jet actuators. However, the jet flow control strategies to reduce the energy or matter consumption of jet actuators for VAWTs should be developed. Based on the validation of computational model, the VAWTs with upward-parabola blowing jet flow control strategy which can suppress the flow separation in advance was numerically investigated at different tip-speed ratios. The results show that the upward-parabola blowing control strategy can dramatically enhance the aerodynamic performance by using significantly low energy or matter consumption. Obviously, this novel control strategy customized for VAWT can be applied in other jet actuators, improving the aerodynamic performance of VAWT. Abstract: Publication date: Available online 12 March 2019Source: Aerospace Science and TechnologyAuthor(s): Peng Jun, Zhang Zijian, Hu Zongmin, Jiang Zonglin In this paper, we study the high-temperature effects on the reflection of shock waves in hypersonic flows by using analytical and computational approaches. First, a theoretical approach is established to solve the shock relations which are further applied to develop the shock polar analytical method for high-temperature air. Then, a comparative investigation using ideal gas model and real gas model considering vibration excitation indicates that the high-temperature effects cause an obvious change to the overall profile of the shock polar. The post-shock pressure increases within the strong branch of the shock polar while decreases within the weak branch due to vibration excitation of air molecules. A more notable phenomenon is the increase in the maximum deflection angle of the shock polar which can significantly influence the detachment criterion of shock reflection transition in high-temperature air flows. The shock polar analysis of shock reflection shows that the high-temperature effects result in an obvious increase to the detachment criterion while a slight increase to the von Neumann criterion. A series of computations are conducted to confirm the above analytical findings on the shock reflection considering high-temperature effects. A slight difference of transition criterion between the theory and computations is found to be caused by the existence of the expansion fan which is an inherent flow structure. The proposed shock polar analytical method is proved to be an effective but simple approach for the study of shock wave reflections in hypersonic flows. Abstract: Publication date: Available online 12 March 2019Source: Aerospace Science and TechnologyAuthor(s): Rei Yamashita, Kojiro Suzuki This paper describes the world's first successful simulation for lateral cutoff phenomena of sonic boom far from the flight path due to variation in atmospheric temperature with altitude. A flow field around an axi-symmetric paraboloid has been analyzed by the full-field simulation method that solves the three-dimensional Euler equations with a gravity term to create a horizontally stratified atmosphere. A solution-adapted structured grid is constructed to align the grid lines with the front and rear shock-wave surfaces in the entire domain, including the near field around a supersonic body and far field reaching the ground beyond lateral cutoff. The flight is assumed to have a speed of Mach 1.2 at an altitude of 10 km, and the computational domain ranges over a distance of 30 km from the axis of symmetry. The computational results show that the evanescent wave in the shadow zone beyond lateral cutoff decays exponentially and changes into a progressive rounding waveform. The characteristics of the waveform transition are in good agreement with those observed in the flight tests. Therefore, the full-field simulation is recognized as a promising approach for investigating sonic boom strength in the full extent of sonic boom noise, including lateral cutoff and evanescent waves. Moreover, the computational results clarify that sonic boom focusing occurs above the ground, except for the vicinity of the ground, and the focusing strength along the lateral cutoff curve detected from the three-dimensional shock-wave surface increases with altitude. The results of ray tracing analysis collaborate the reasonability of the simulation results, and the caustic of downward convex agrees well with the lateral cutoff curve. In the shadow zone, the magnitude of exponential decay increases with altitude, and the lateral distance where the pressure rise decreases rapidly shortens with altitude. Abstract: Publication date: Available online 12 March 2019Source: Aerospace Science and TechnologyAuthor(s): Hyeonsoo Yeo This paper reviews lessons learned from the compound helicopter studies performed by NASA and the US Army Aviation Development Directorate to support the NASA Heavy Lift Rotorcraft Systems Investigation and the US Army's Joint Heavy Lift (JHL), Joint Multi-Role Technology Demonstrator (JMR-TD), and Future Vertical Lift (FVL) programs. These studies explored performance potential of advanced rotorcraft and investigated the impact of key modern-technologies in performance, weight, and aerodynamics on rotorcraft. The compound helicopter configurations considered in this paper represent a wide range of sizes, gross weight, rotor systems, and operating conditions. A brief description of design and aeromechanics analysis tools and methodologies is provided. Rotor performance correlation results at high advance ratio, which are critical for the accurate design and analysis of high-speed rotorcraft, are shown. Detailed aeromechanics analysis results, such as the effects of various compounding methods, lift share between rotor and wing, rotor rotational speed, blade twist, aircraft drag, and rotor/wing interference on aircraft performance, are presented. Abstract: Publication date: Available online 12 March 2019Source: Aerospace Science and TechnologyAuthor(s): Pengfei Fu, Lingyun Hou, Zhuyin Ren, Zhen Zhang, Xiaofang Mao, Yusong Yu Droplet impact on a solid wall contributes to droplet vaporization and cooling on the inner wall. A new droplet/wall impact model is developed and fitted from the experimental data, which takes both kinematic parameters of the impinging droplets and thermal parameters of the solid wall into consideration. The model describes the behavior of droplets after impact and identifies five representative regimes, i.e., stick/spread, suspend, rebound, boiling including breakup, and splash, through the critical Weber number of droplets and wall temperature. To assess the new model, numerical simulations were performed of propellant droplets impacting the wall of a bipropellant rocket engine chamber. A comparison with experimental data shows better predictions of the wall temperature of the chamber than obtained from previous models. A larger number of large-sized monomethylhydrazine and nitrogen tetroxide droplets in the boiling induced breakup and splash regimes break into smaller droplets when using the new model. There are also temperature peaks near the impact points and near the throat. Especially in the throat of the combustion chamber, the new model predicts the wall temperature distribution accurately, offering improved prediction of the combustion chamber and assessing thermal protection of the throat. Abstract: Publication date: Available online 28 February 2019Source: Aerospace Science and TechnologyAuthor(s): M. Zarei Mahmoudabadi, M. Sadighi The energy absorption characteristics of sandwich panels with aluminum plate as facesheet and metal hexagonal honeycomb as the core are investigated under quasi-static punch loading using two flat nose and spherical projectiles, experimentally. Failure modes are classified as plastic hinges, facesheet wrinkling, debonding of the adhesive layer between the facesheet and core, facesheet tearing, out of plane core crushing, in-plane core folding, core tearing and detachment from the support. Furthermore, the article examines the influences of six parameters including honeycomb wall thickness, sandwich core thickness, facesheet thickness, aspect ratio, adhesive layer between facesheet and core and existence of bottom facesheet. The results show that the increase in core thickness improves the energy absorption parameters of sandwich panel better than the increase in the facesheet thickness. Specific absorbed energy is increased linearly by increasing the honeycomb core thickness while it seems that the mentioned parameter has a meaningless dependence on the facesheet thickness. In addition, a 12 percent quota of adhesive layer between top facesheet and core is indicated in the energy absorption capacity of a sandwich panel for both flat nose and spherical projectiles, while its effect on the value of maximum force is 17% using flat nose projectile and 25% using the other one. Despite the major influence of the existence or non-existence of the bottom facesheet on the sandwich failure modes, its absorbed energy changes less than 3.5 percent; yet other parameters such as specific energy absorption and peak load are more dependent on the existence or non-existence of the bottom facesheet. Finally, keeping the honeycomb wall less thick improves the energy absorption characteristics of the sandwich panel. Abstract: Publication date: Available online 25 February 2019Source: Aerospace Science and TechnologyAuthor(s): Aravinth Sadagopan, Cengiz Camci The advancement of multi-dimensional and viscous computational tools has eased the accessibility and overall effort for thorough analysis of complex turbomachinery designs. In this paper, we computationally evaluate a high-pressure ratio supersonic mixed-flow compressor stage designed using an in-house mean-line code. Objective is to include three dimensionalities, viscous flow and compressibility effects including the shock wave systems into account. As mixed-flow compressors are advantageous especially for small jet engine applications we choose mass flow rate, stage total pressure ratio and maximum diameter as the main design constraints. This computational analysis is the second paper of a two-part series explaining strategy for designing a high-pressure ratio mixed-flow compressor stage. The high-pressure ratio and small diameter requirements push this compressor for a highly-loaded supersonic ‘shock-in rotor’ design with supersonic stator/diffuser.The used RANS based computational fluid dynamics model is thoroughly assessed for its ability to predict compressor performance using existing well-established experimental data. NASA Rotor 37 and RWTH Aachen supersonic tandem stator are chosen as the test cases for exhibiting similar flow characteristics to present design. The computational approach helps to shed light upon the mixed-rotor and supersonic-stator 3D shock structures and viscous/secondary flow. Stage performance map, pressure and velocity distribution of this high-pressure ratio mixed-flow compressor is obtained. Areas of design optimization are highlighted to further improve performance and efficiency. The in-house mean-line design code predicted a pressure ratio of 6.0 with 75.5% efficiency for a mass flow rate of 3.5 kg/s. The mean-line code obviously lacked to fully represent three-dimensionality effects due to its inherent over-simplifying assumptions thus, inclusion of RANS based computations improves the fidelity of mixed-flow compressor design performance calculations at a great rate. Comprehensive computational analysis of the stage shows that our design goal is met with a stage total pressure ratio of ΠTT = 5.83 with an efficiency of ηIS = 7% for a mass flow rate of m˙ = 3.03 kg/s. A total pressure ratio of 6.12 at 75.5% efficiency is reached with a 3.5% increase in design rotational speed. Abstract: Publication date: Available online 19 February 2019Source: Aerospace Science and TechnologyAuthor(s): Fernando Tejero, Matthew Robinson, David G. MacManus, Christopher Sheaf Future turbo-fan engines are expected to operate at low specific thrust with high bypass ratios to improve propulsive efficiency. Typically, this can result in an increase in fan diameter and nacelle size with the associated drag and weight penalties. Therefore, relative to current designs, there is a need to develop more compact, shorter nacelles to reduce drag and weight. These designs are inherently more challenging and a system is required to explore and define the viable design space. Due to the range of operating conditions, nacelle aerodynamic design poses a significant challenge. This work presents a multi-objective optimisation approach using an evolutionary genetic algorithm for the design of new aero-engine nacelles. The novel framework includes a set of geometry definitions using Class Shape Transformations, automated aerodynamic simulation and analysis, a genetic algorithm, evaluations at various nacelle operating conditions and the inclusion of additional aerodynamic constraints. This framework has been applied to investigate the design space of nacelles for high bypass ratio aero-engines. The multi-objective optimisation was successfully demonstrated for the new nacelle design challenge and the overall system was shown to enable the identification of the viable nacelle design space. Abstract: Publication date: Available online 28 January 2019Source: Aerospace Science and TechnologyAuthor(s): John Z. Ma, Shujie Zhang, Mingyi Luan, Jianping Wang This study explored the phenomenon of the detonation formation delay time in a RDE with an annular combustion chamber with an array of holes fueled with hydrogen. It was determined that the delay time increased when the combustor prefilling time increased. Due to the explosion, the interaction of the shock wave and the pressure wave in the combustor leads to an increase in pressure near the inlet wall surface, thereby impeding the gas feeding. The wavelet transformation was used to analyze the pressure time signal associated with the detonation wave, which was found to be better than the fast Fourier transform typically used. Moreover, the phenomenon of single–double–single wave transformation was observed, of which the underlying mechanism can be explained by an interactive-adjusting process. Also, the experiment captured the reinitiation phenomenon of detonations after a long period of time (around 300 ms) of extinction. Abstract: Publication date: Available online 4 January 2019Source: Aerospace Science and TechnologyAuthor(s): Adel Ghenaiet, Smail Khalfallah The determination of stall onset is very useful for the control and safe operation of centrifugal compressors at high pressure ratios. This is very delicate and intricate task since the details of the flow need to be acquired at several measuring planes. The state-of-the-art CFD tools have contributed substantially in the analysis of the flow structures and the design of centrifugal compressors. The present paper demonstrates the potentiality of numerical simulations to map the full flow field and assess some criteria to predict the stall onset, typically those relating the boundary layer growth and stability. Through the entire impeller and diffuser, the quantification of the blockage factor in addition to the modified loading criteria (diffusion rate) which combines the blade-to-blade and hub-to-shroud Richardson numbers seem more suitable in predicting the stall onset and stall cells positions. The well known models of centrifugal compressors operating at low-speed (LSCC) and at a high-speed (DLRCC) served for the validations. Besides, the present CFD based criteria are useful since they may easily integrate the design optimization chain. Abstract: Publication date: Available online 3 December 2018Source: Aerospace Science and TechnologyAuthor(s): Kyun Ho Lee A space propulsion system has a crucial role to perform several mission operations of a spacecraft successfully in an orbit. When a thruster is fired, the exhaust plume gas can have effects on the performance of a spacecraft because the expanded plume gas molecules directly collide with the spacecraft surfaces in the vacuum environment. Thus, the present study investigated more realistic plume flow behaviors using a global kinetic reaction model for an actual combustion process of a fuel and an oxidizer. To achieve this, the 4-step global combustion model of monomethylhydrazine and nitrogen tetroxide was incorporated for the first time in the plume flow analysis to reflect a more practical firing condition of a bipropellant thruster. Then, thermal and mass diffusion predictions of the plume flow were compared with the chemical equilibrium condition to examine the distinct differences between the proposed and conventional approach. For efficient numerical calculations, the Navier–Stokes equations and the DSMC method were combined to deal with a continuum flowfield inside the thruster and a rarefied plume gas flow outside the nozzle together. With the present analysis results, major differences in the thermal and mass behaviors of the plume gases were compared between the two reaction models, and their influences are also discussed. Abstract: Publication date: Available online 24 October 2018Source: Aerospace Science and TechnologyAuthor(s): Yun Tian, Jianchong Quan, Peiqing Liu, Doudou Li, Chuihuan Kong Mission adaptive variable camber wing in both chord-wise and span-wise directions that can improve the aerodynamic performance during takeoff, landing and cruising flight, will be the state-of-the-art high-lift system for next generation airliners. Based on NASA TrapWing model released on the 1st AIAA CFD High-lift Prediction Workshop, a smart high-lift system with “Flexible Droop Nose & Single Slotted Hinge Flap combined with spoiler deflection & Flexible Trailing Edge Flap” is proposed in this paper. The Flexible Droop Nose is actuated by kinematic chains mechanism, the Single Slotted Hinge Flap is actuated by simple hinge mechanism and the Flexible Trailing Edge Flap is actuated by link/track mechanism.A mechanism/structure/aerodynamic multidisciplinary optimization platform based on iSIGHT software is constructed for this smart high-lift system. This platform consists of stress analysis, high-lift configuration generation, high-lift configuration structure grid generation, computational fluid dynamics and optimization algorithm modules. The optimal takeoff and landing configurations with comprehensive performance of mechanism, aerodynamic and structure is then obtained after multidisciplinary optimization. Finally, the CFD results show that the aerodynamics performance of this smart high-lift system is more effective than the original NASA TrapWing model. 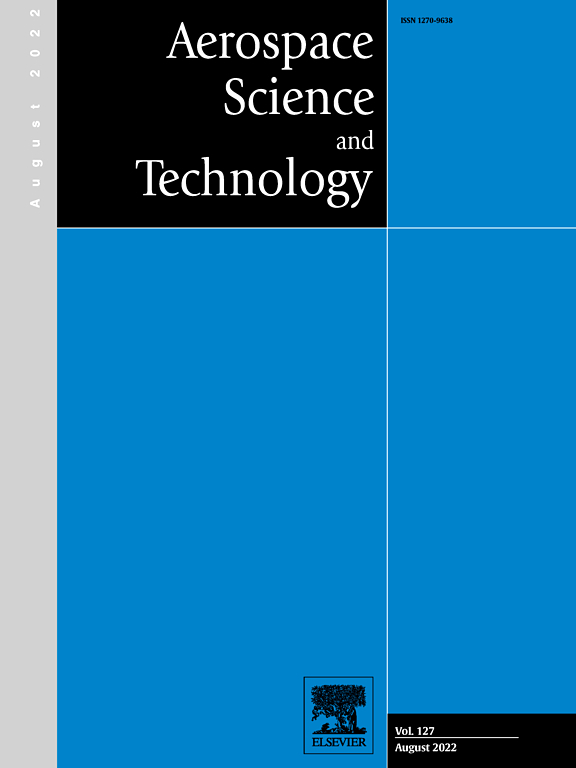 Abstract: Publication date: Available online 9 March 2019Source: Aerospace Science and TechnologyAuthor(s): Aaron D. Koch Currently, algorithms exist for the optimal staging of serially staged rockets under loss-free conditions. These algorithms are based on the Tsiolkovsky rocket equation. Here, one variant is extended to include velocity losses and/or fairing separation. Instead of simply adding the velocity losses to the required loss-free Δv and freely distributing the total amount among all stages, a two-step process is implemented. First, the loss-free solution is obtained to determine the optimal velocity gain for each stage. Then, the rocket's stages are iteratively scaled up, starting with the uppermost stage and continuing downwards. The size of each stage is enlarged so that it generates Δv equal to the optimal velocity gain plus the losses occurring during its flight. Also, each stage accounts for the increased mass of the stages on top of it. Adding the velocity losses after the optimization step ensures that they are allocated to the correct stages. Ariane 40 is used as an example for a three-stage rocket. In this case, the proposed method produced realistic payload ratios, in contrast to the old idea of adding the velocity losses directly to the required loss-free Δv. As the method requires inputs that stem from a trajectory analysis, it works best when iteratively coupled to a trajectory optimizer. In doing so, Ariane 40's total payload ratio was increased, while taking both velocity losses and fairing separation into account. Abstract: Publication date: Available online 8 March 2019Source: Aerospace Science and TechnologyAuthor(s): Yayun Shi, Tihao Yang, Junqiang Bai, Lei Lu, Hui Wang A transonic wind tunnel transition test is implemented on a fuselage-wing configuration with the sweep angle 35∘ for commercial aircraft. The wide range of angle of attack from −3.69∘ to 3.07∘ assures that with increasing angle of attack, the laminar to turbulent transition dominant factor varies from cross-flow (CF) vortices to Tollmien-Schlichting (TS) waves. With linear stability theory, the limiting N-factors are calibrated based on the pressure distribution by experiment or the Reynolds Averaged Navier-Stokes (RANS) solver using the fixed experimental transition location. The pressure distribution of the RANS solver agrees well with the experiment in general except some small discrepancies, which causes deviation by 0.6 for the limiting TS N-factor. The RANS solver and the stability analysis provide the limiting N-factors of 7.0 and 8.7 for CF-vortices and TS-waves at the two sides, respectively. In the between, the TS value decays with the CF value due to their interaction. Thus, the transition criterion for limiting N-factors is established for the laminar prediction tool of eN method at similar transonic wind tunnel. With the transition criterion, the transition location difference for 95% cases between the simulation and the experimental data is lower than 5% chord. The good match illustrates that the transition tool is accurate and robust for engineering applications, and also verifies the reasonability of the limiting N-factors. Therefore, the transition criteria at similar transonic conditions and well-performed eN transition tool can be applied for the future laminar wing design. Abstract: Publication date: Available online 8 March 2019Source: Aerospace Science and TechnologyAuthor(s): Aqib Khan, Rohit Panthi, Rakesh Kumar, S. Mohammad Ibrahim Plug and ramp nozzles offer many advantages over the conventional converging-diverging counterpart and have received much attention in the recent decades. Variants of plug nozzles have been investigated for a wide range of operating conditions. The performance of these nozzles is dependent on the flow development on the plug or ramp surface, which in turn is greatly influenced by the cowl geometry. Experiments are conducted to study the planar plug nozzle flowfield for Mach 1.8 and 2.2 using half nozzle geometry. The work primarily focuses on the influence of the cowl length on the flow evolution on the plug surface at different nozzle pressure ratios (NPRs). The cowl of the outer nozzle is extended to 10, 30, 50 and 100% of the full plug length. This allows the supersonic flow to partially expand internally ahead of the throat section. Schlieren images are used to visualize the wave structure at different pressure ratios for different cowl lengths. For low NPRs, the nozzle with extended cowl behaves more like a conventional planar nozzle with strong shock waves. It is observed that the cowl length influences the pressure distribution on the plug surface only for low NPRs. The effect of side walls on the flow field of planar plug nozzles is also studied. Abstract: Publication date: Available online 7 March 2019Source: Aerospace Science and TechnologyAuthor(s): Robert Dibble, Vaclav Ondra, Branislav Titurus Varying the rotational speed of the main rotor is one method being considered to improve the performance of future rotorcraft. However, changes in rotor speeds often lead to resonant interactions between rotor blade modes and the rotor's excitation frequencies which increase the vibratory loads in the rotor. This research investigates the use of a compressive load to reduce a blade's natural frequencies and its potential to be used as a resonance avoidance technique by improving separation between the natural and excitation frequencies of a blade. The research presented herein describes and validates a model of a pretwisted rotating beam with non-coincident mass and elastic axes with an applied compressive load. The compressive load is applied at the elastic axis at the tip of the beam and is orientated towards the root of the beam. The beam model is then used in a case study to represent the rotor blade of a typical mid-sized civilian helicopter. The case study is performed to calculate the natural frequencies of a compressed blade for a reduction in rotor speed of up to 40% and evaluate the performance of the compressive load resonance avoidance technique. The results of the case study show that the compressive load improves the separation between natural and excitation frequencies over the full range of rotor speeds evaluated. The improved separation allows the rotor to operate safely with a reduction in rotor speed of up to 19%. Abstract: Publication date: Available online 7 March 2019Source: Aerospace Science and TechnologyAuthor(s): Lei Sun, Yong Huang, Ruixiang Wang, Xiang Feng, Zhilin Liu, Jiaming Wu The lean blowout (LBO) limit is a crucial performance for aircraft engine combustors. It is essential to obtain the LBO limit during the design stage of the aircraft engine combustors. The semi-empirical correlation is an important tool for quick prediction of the LBO limits. Among all the semi-empirical correlations for the prediction of the LBO limits, Lefebvre's LBO model is widely used for the swirl stabilized combustors. The Flame Volume (FV) model was proposed based on Lefebvre's LBO model to accommodate the effects of the geometry of the flame tube on the LBO. Meanwhile, the multi-point lean direct injection (MPLDI) combustor whose geometry of the dome is different from the traditional combustors is a promising low NOx emission combustor. Up to now, there are few existing semi-empirical correlations to predict the LBO limit for the MPLDI combustors although the prediction of the LBO limit is critical for them. Based on the FV concept and new physics-based analysis, the FV-MP (Flame Volume for the Multi-Point) model is derived to predict the LBO limits for the MPLDI combustors. The FV-MP model could accommodate the effects of the fuel staging and recessed pilot stage, in addition to the operating conditions, on the LBO limits of the MPLDI combustors and achieve better prediction accuracy than both the FV and Lefebvre's LBO models within the range of corresponding validation experiments. Compared with Lefebvre's LBO model, the FV model could double the prediction accuracy. Compared with the FV model, the FV-MP model could further double the prediction accuracy. Abstract: Publication date: Available online 7 March 2019Source: Aerospace Science and TechnologyAuthor(s): Pu Zhang, Jinglei Xu, Yang Yu, Wei Cui Influences of adverse pressure gradient (APG) on supersonic turbulent boundary layers are numerically studied using Reynolds-averaged Navier-Stokes (RANS) equations. The RANS methodology is validated by comparing the numerical results with the existing experimental data. Although the flame is restricted in the boundary layer, the heat flux is reduced rather than increased for the suppressed turbulence momentum transportation ability. Moreover, APG contributes more to the heat flux than combustion heat release does. Compared with no-injection case, a large skin friction reduction can be obtained by boundary layer combustion, and further reduction can be achieved in APG state. Additionally, the effects of combustion in APG on the velocity laws of the wall show that White's velocity law is close to the numerical results in the outer region of boundary layer, and Nichols's velocity law is appropriate in the whole boundary layer unless the APG is too strong. Turbulence intensity influences are analyzed in the end. Results show that the additional reduction of skin friction due to induced combustion cannot offset the skin friction increase caused by high turbulence intensity. Abstract: Publication date: Available online 6 March 2019Source: Aerospace Science and TechnologyAuthor(s): M.V. Srisha Rao, S.K. Karthick Dynamic modal analysis enables new insights into the spatio-temporal dynaimcs of complex flow scenarios. Time resolved schlieren imaging provides significant information in compressible flow scenarios on flow structures and their evolution. We conduct a systematic study using synthetic images and experimental schlieren images on the effect of image acquisition parameters on the modal analysis by dynamic mode decomposition (DMD). We consider the effect of two important capture parameters - the capture rate (fs) and the exposure time (texp). Analysis is carried out on two sets of synthetic images, SI-I, an unsteady wavy interface created using a linear combination of sinusoids, and SI-II - hypothetical shock oscillations. Finally, a flapping supersonic jet is observed using high-speed schlieren with a nano-pulsed laser light source with three different imaging parameters. We find that among the two parameters the effect of exposure time on modal analysis and its interpretation is more pronounced than capture rate. An exposure time of 5% of maximum exposure produces 8% reduction in mode amplitude, and in case of long exposure the dynamic significance of modes undergoes complete change. If the flow images are instantaneous, then the spatial mode shapes of dominant modes remain the same irrespective of the capture rate. Aliasing has to be considered in sub-Nyquist capture rates, however, the actual frequencies can be suitably resolved. Abstract: Publication date: Available online 6 March 2019Source: Aerospace Science and TechnologyAuthor(s): Yang Lu, Taoyong Su, Renliang Chen, Pan Li, Yu Wang The aerodynamic environment during the flight of a helicopter is complex because of the severe aerodynamic interaction between various components. To fully consider the effect of aerodynamic interaction in the initial stages of helicopter design and to eliminate or reduce its adverse effects, a comprehensive design optimization method for the aerodynamic layout of a helicopter that is capable of reducing the adverse effects of aerodynamic interaction is developed in this paper. To satisfy the requirements for precision and efficiency in the calculation model, an aerodynamic interaction analysis model of various helicopter components was established based on a viscous vortex particle and the unsteady panel hybrid method. To simultaneously consider the influences of the position and shape of the aerodynamic components on the aerodynamic interaction during the optimization process, parameter modeling of the helicopter's shape was performed based on the class function/shape function transformation (CST) method. A Kriging surrogate model of the objective function was further developed and combined with a hybrid sequential quadratic algorithm and genetic algorithm optimization strategy to establish a comprehensive optimization flow for the aerodynamic layout of a helicopter that reduces the adverse effects of aerodynamic interaction. Verification was carried out based on a fuselage shape derived from UH-60 helicopter. The optimization results showed that the use of the comprehensive optimization method for the aerodynamic layout of a helicopter can effectively reduce the adverse effects of aerodynamic interaction. Based on the optimization objectives, the efficiency of hovering increased by 4.7%, the hovering ceiling increased by 3.48%, the speed stability derivative increased by 264.7%, and the angle of attack stability derivative decreased by 26.4%. Abstract: Publication date: Available online 6 March 2019Source: Aerospace Science and TechnologyAuthor(s): Chengyu Zhang, Volker Gümmer Incorporating recuperators into gas turbines shows considerable potential for lower emissions and fuel consumption. Nowadays the technology readiness of advanced compact heat exchanger has provided a solid foundation for the availability of lightweight, higher efficient recuperators which would find good acceptance on the rotorcraft without penalizing the operational capabilities. To understand the impact of recuperator on the whole system for further development of future recuperated helicopter, it is proposed to evaluate the potential of recuperated helicopter turboshaft engines with emphasis placed on highly effective primary surface recuperator. This paper presents a comprehensive multidisciplinary simulation framework, and the aircraft configuration selected is a generic helicopter, which is similar to the helicopter Bo105, equipped with two Allison 250-C20B turboshaft engine variants. The improved part-load performance against the reference non-recuperated cycle is discussed first, followed by the analysis and evaluation of two representative flight missions. The study is finally extended to quantify the flight time required to compensate for the additional recuperator weight under the flight condition of 0-250 km/h and 0-3000 m for different recuperator design effectiveness values. It is suggested that the selection of recuperator effectiveness should be dependent on the most commonly involved mission profile and flight duration, in order to offset the added parasitic weight of the recuperator. The established rotorcraft multidisciplinary framework proves to be an effective tool to conduct a comprehensive assessment for the recuperated helicopter under a wide range of flight conditions as well as at mission level. Abstract: Publication date: Available online 4 March 2019Source: Aerospace Science and TechnologyAuthor(s): Dongyue Gao, Zhanjun Wu, Lei Yang, Yuebin Zheng, Wan Yin In order to monitor the structural conditions, an SHM technology is necessary for long-term aircraft storage tanks under cryogenic conditions. In this paper, a PZT- based Lamb waves SHM technology is developed for such storage tanks. In order to determine the survivability, durability of different PZT-epoxy sensor systems and functionality of the damage diagnosis method under cryogenic conditions of long-term storage tanks, a series of tests have been conducted. First, the durability of PZT-epoxy sensor systems under cryogenic environment was considered by cryogenic durability tests. Simultaneously, performance tests of different PZT-epoxy sensor systems were performed, include high strain performance test and Lamb waves propagation tests under different temperature environments. The high strain performance of different epoxy adhesives under cryogenic environments was investigated by lap shear strength tests. The functionality of different PZT-epoxy sensor systems was investigated by Lamb waves propagation tests. At last, the damage diagnosis ability of the SHM technology was evaluated in a composite damage diagnosis experiment under cryogenic temperature. Experimental results demonstrated that the developed SHM technology can withstand operational levels of high strain and long-term under cryogenic/room temperature on cryogenic storage tanks, and is functional in the cryogenic environment. Abstract: Publication date: Available online 4 March 2019Source: Aerospace Science and TechnologyAuthor(s): Xingyun Jia, Qun Zheng, Yuting Jiang, Hai Zhang A new type of seal, called a T type labyrinth seal is proposed to reduce exciting force induced by seal region flow, thereby reducing rotor vibration in aero-engines. The whole circle computational model is performed, and the vibration characteristics parameters are defined at the boundary of the seal flow field to consider the effect of rotor vibration. The new type seal is analyzed along with the interlaced and straight through labyrinth seals. The enhanced Lomakin effect of seal flow field caused by the T-shaped tooth contributes to the great increase in the inward radial aerodynamic force. With the same axial length of the seal and the tip clearance, the leakage of T seal is approximately 23.6-25.3% less than the straight through labyrinth seal, and approximately 7.4-8.5% more than the interlaced labyrinth seal. Abstract: Publication date: Available online 4 March 2019Source: Aerospace Science and TechnologyAuthor(s): Zhengang Liu, Zhenxia Liu, Fei Zhang, Yanan Liu Particles depositing is a severe damage to the aerodynamic and cooling performance of turbine guide vanes and a technique to decrease depositing is transverse trench. In this paper, the experiments are conducted to study the effects of different transverse trenches on the particles depositing and temperature on a plate. The particles are generated by atomizing molten wax. All the models are made based on a plate and have film cooling holes. Different transverse trenches with different widths and depths are installed along the row of the film cooling holes. The experimental results show that the trenches could alter the depositing mass and distribution on the pressure surface of the model. The narrower or deeper trench could result in the lighter depositing mass and more uniform depositing distribution on the vicinity downstream of the row of film cooling holes. However, the trenches have little effect on the depositing upstream of the row of film cooling holes on the pressure surface of the model. The more depositing under the experimental conditions leads to higher temperature on the pressure surface of the model. The temperature distribution on the vicinity downstream of the row of film cooling holes could also be altered by the trenches. The narrower or deeper trench could make the temperature distribution more uniform. This could be attributed to the effect of the trench on the depositing and the direct effect of itself on the temperature distribution.